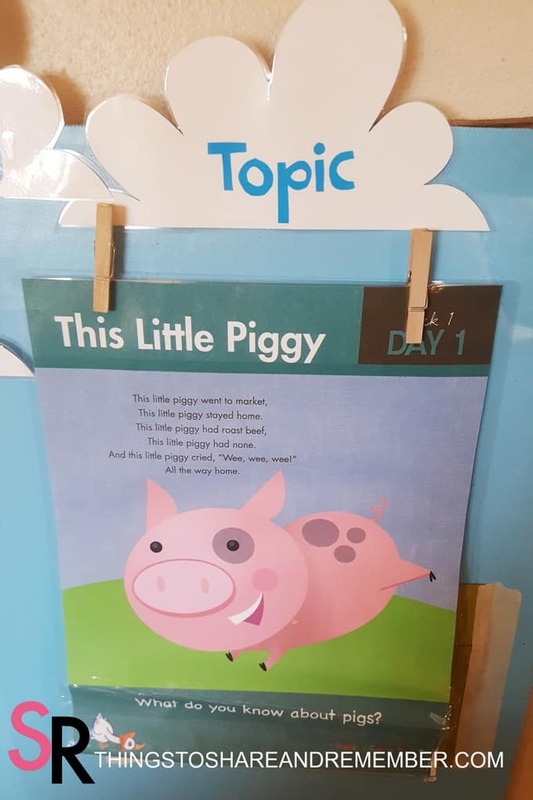 Our nursery rhyme theme continues! 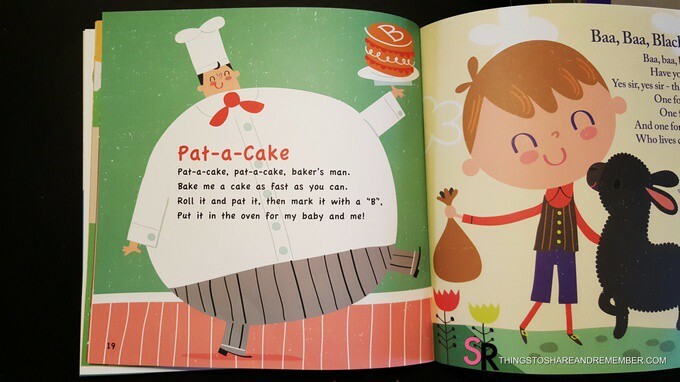 Pat a Cake Nursery Rhyme Activities were probably one of our favorites – I’m thinking this is because it involved cake! 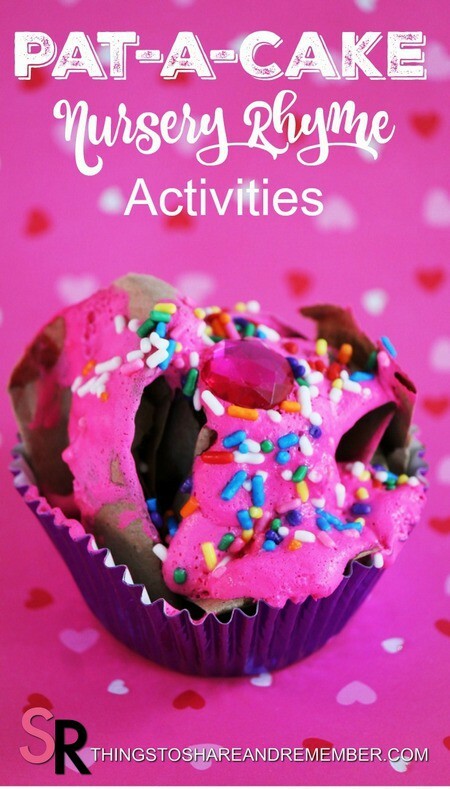 Check out our sequencing activity, cupcake baking and cupcake Invitation to Create. 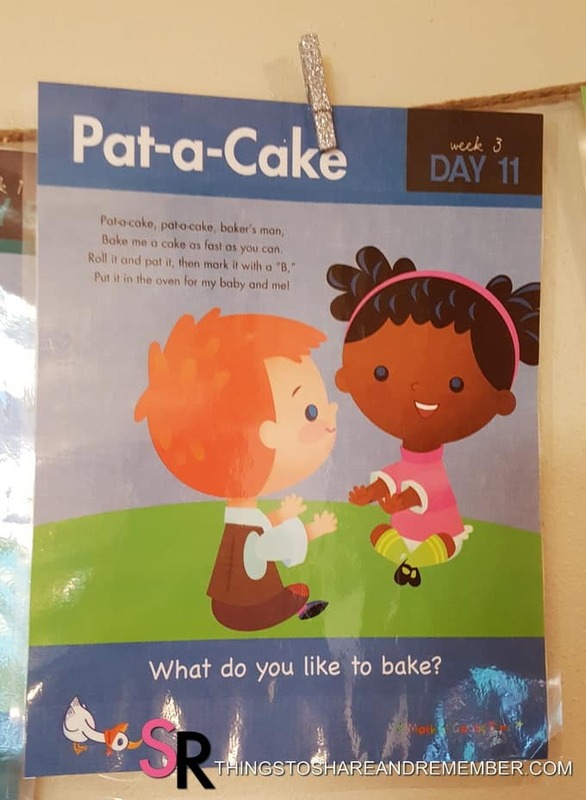 Pat-a-Cake, pat-a-cake, baker’s man. 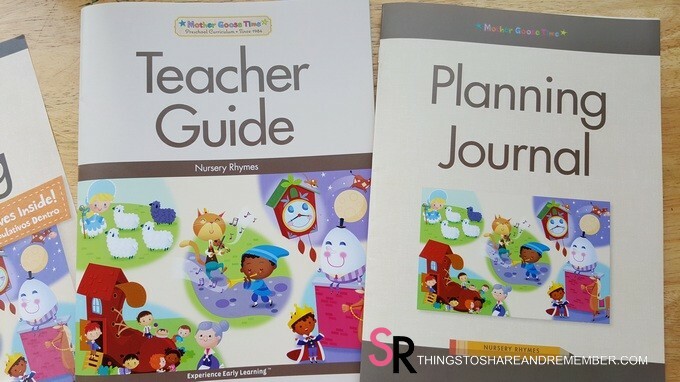 This nursery rhyme book is full of nursery rhymes with adorable pictures. Our nursery rhyme posters are all displayed around our room. 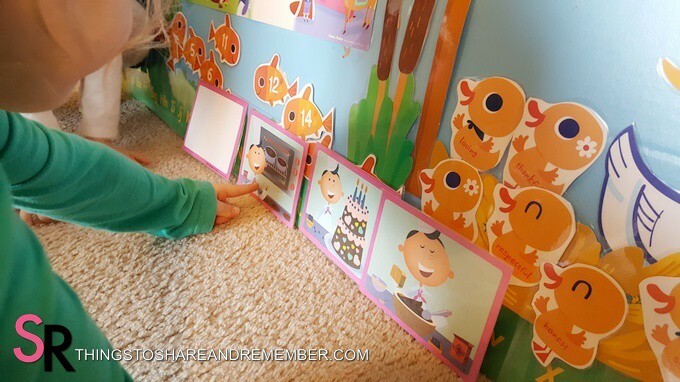 I love these simple story sequence cards! At first glance, they seem “too easy”. Let’s take a closer look. I lay out the cards randomly. I ask a child, “What’s happening in this picture?” We really dissect it, using all the clues in the picture to tell a story. Then we go through the other cards. Next, we put the cards in sequence, using the blank card at the end. I ask, “What do you think happens next?” That pretty much covers it, but consider putting that blank card in a different place. What could we say happens that we don’t see in the picture? 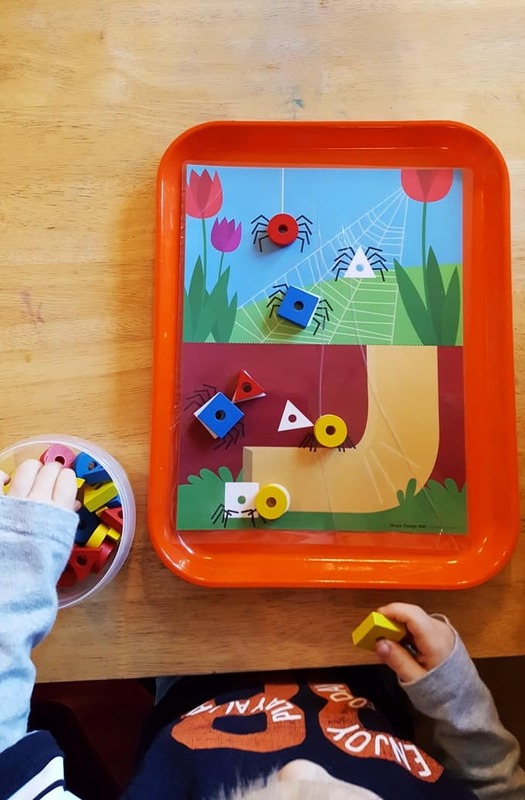 Using the words first, second, third and fourth, as well as next, helps children understand the sequence of events and tell their own stories. What can you do to help out in the kitchen? 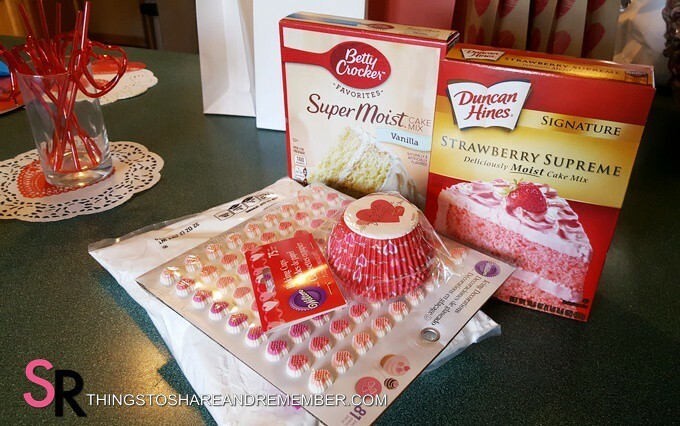 Everyone helped decorate the cake with foam heart shapes. 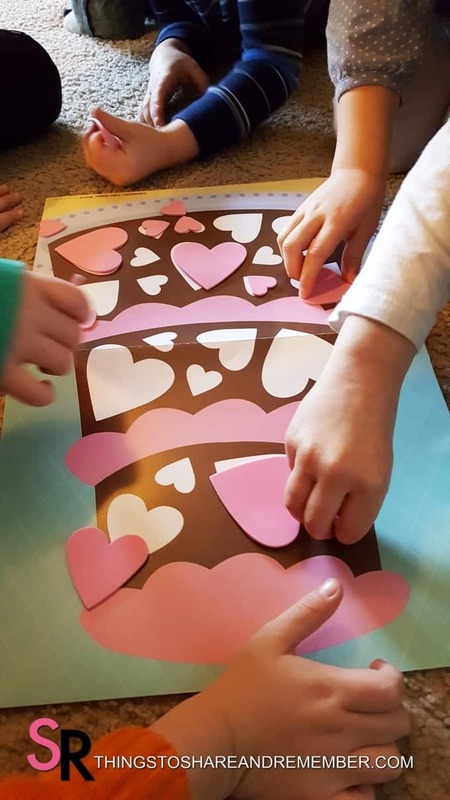 Number cards were included in this activity so the children could take turns drawing a card and placing that number of hearts on the cake. It ended up being a free for all. Ah well… some days are like that. 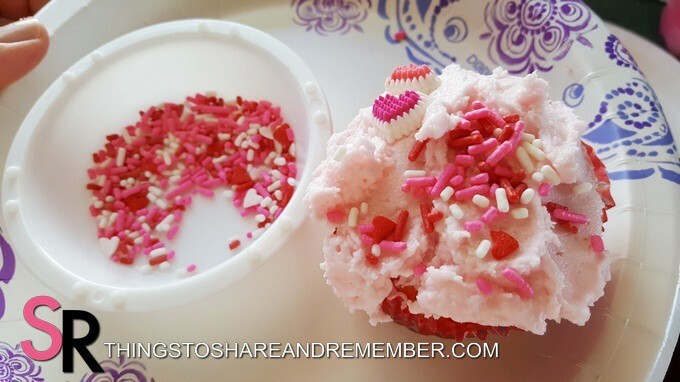 Pat-A-Cake day fell right before Valentine’s Day so for our party treat, we made cupcakes. 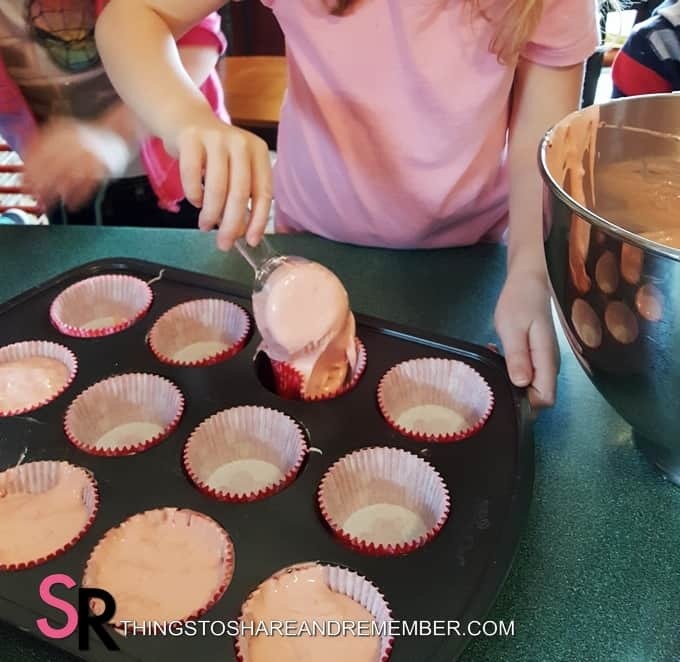 Everyone got to help make the cupcakes. 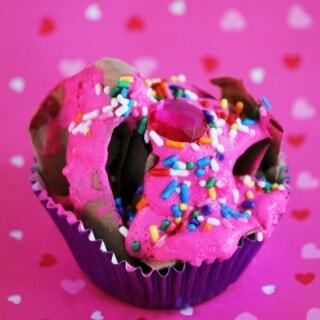 They took their jobs seriously and made very yummy cupcakes. 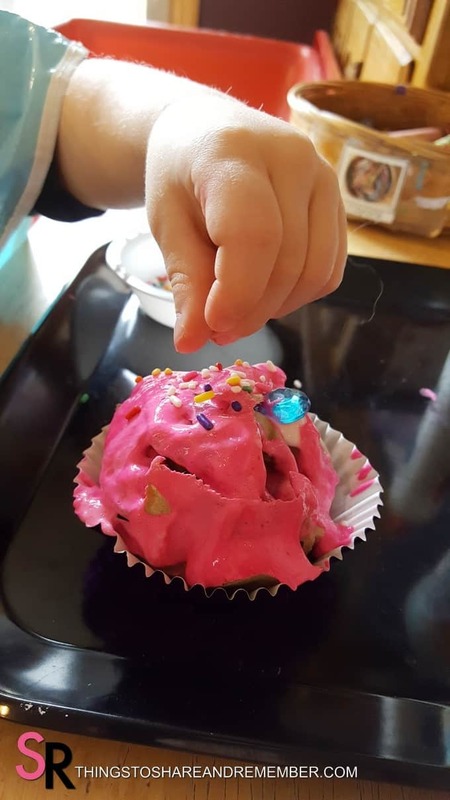 Each child frosted and decorated their own cupcake. Yum! 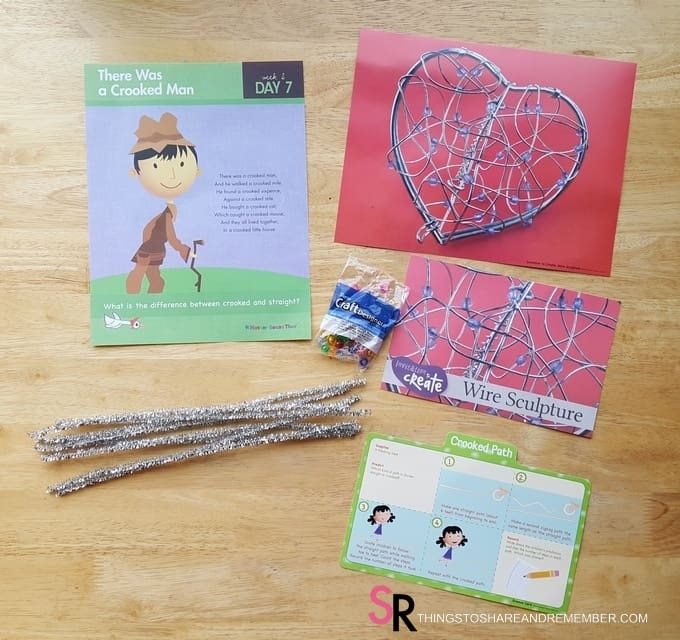 Loved this Invitation to Create! 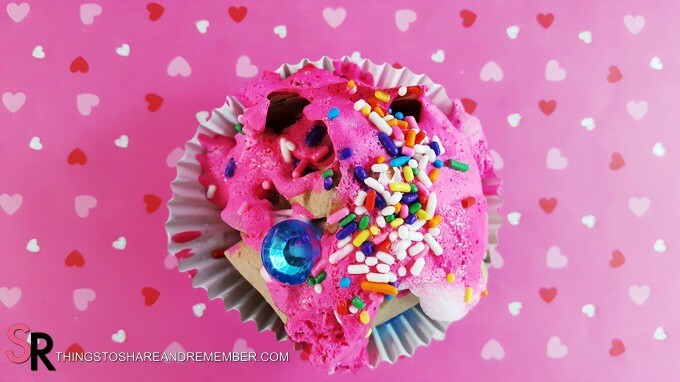 How fun is this – making pretend cupcakes! 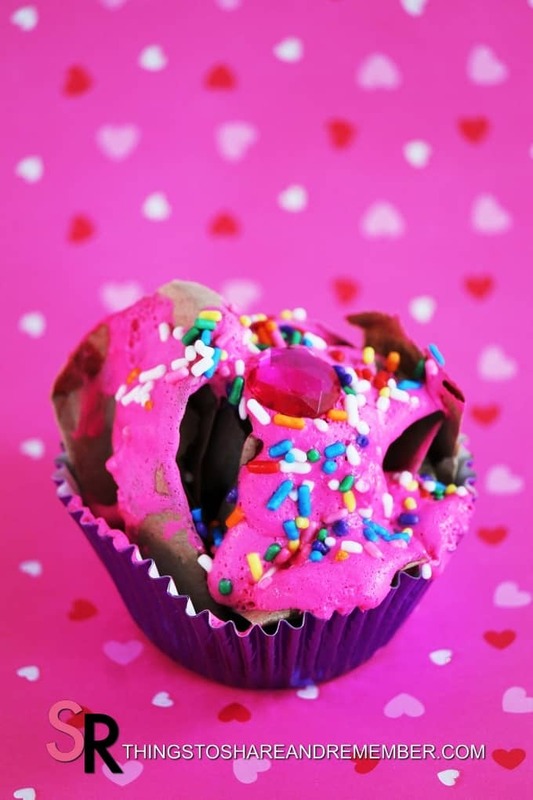 The cupcake photo is just so attractive, of course, everyone was interested in this project! 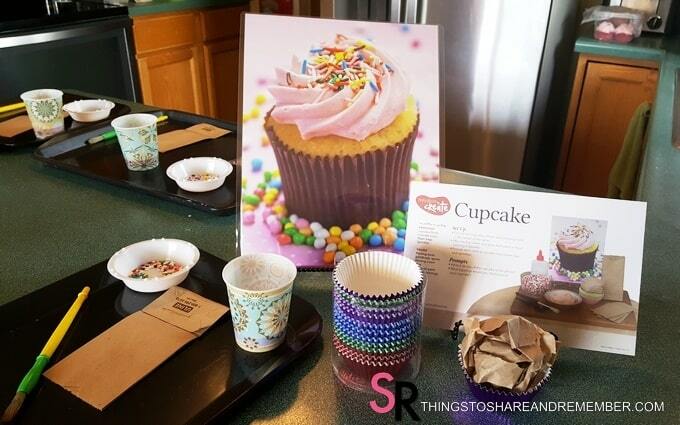 Supplies include: cupcake liners, small paper bags, paint mixed with saving cream for frosting and sprinkles. 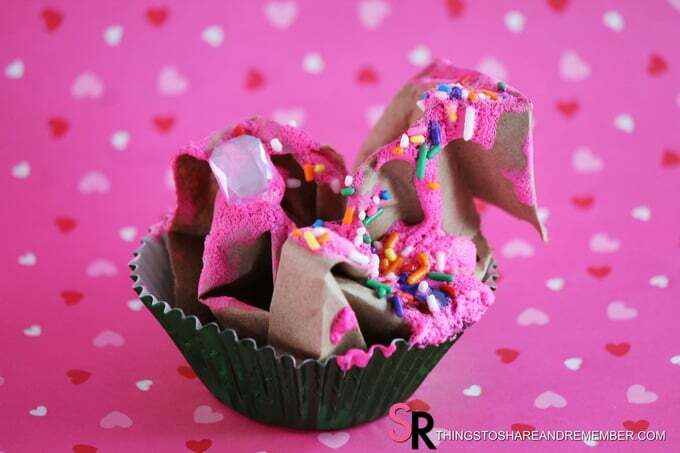 It was a little challenging to get the crumpled paper bag to stick to the cupcake liner so some kids were frustrated with that. 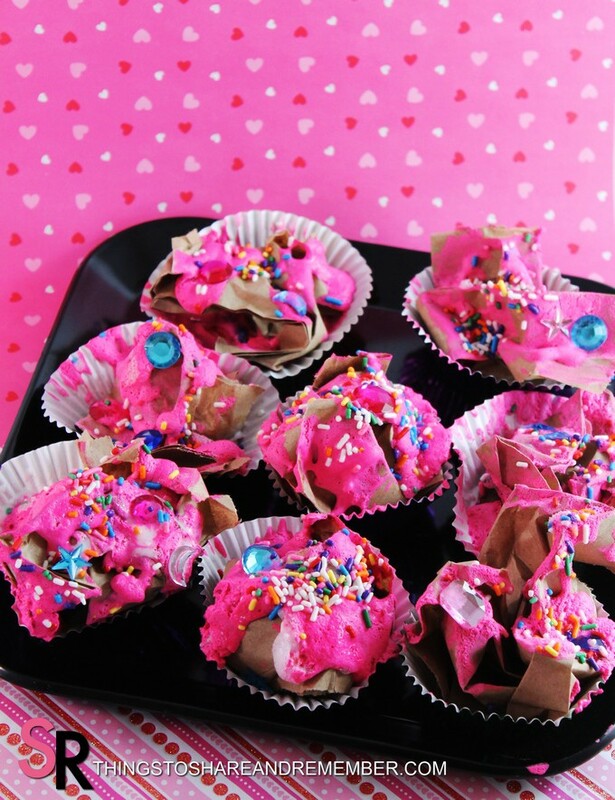 I could have offered a cupcake pan for the kids to make their project in. It would hold the shape better until it dried. 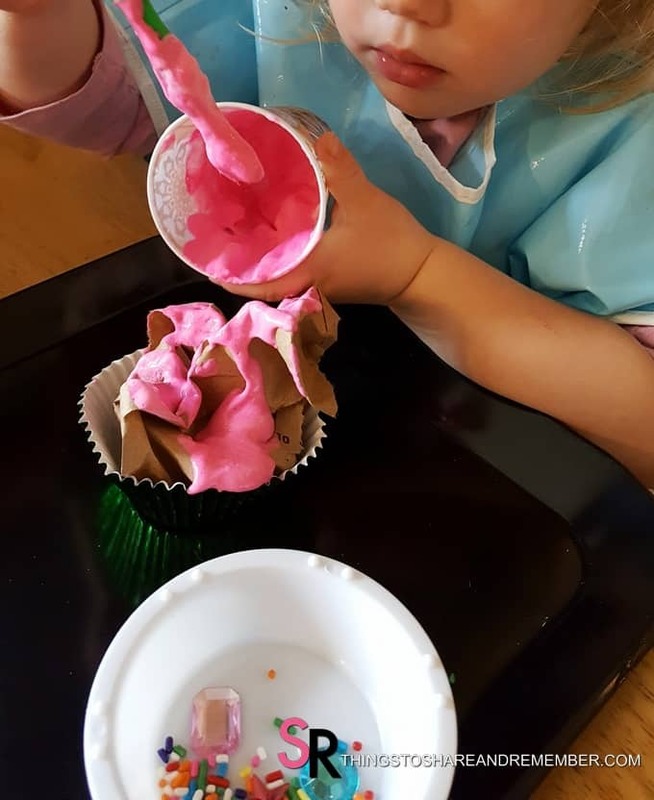 Paint mixed with shaving cream and glue is fabulous for “frosting”! It’s more realistic than regular paint. 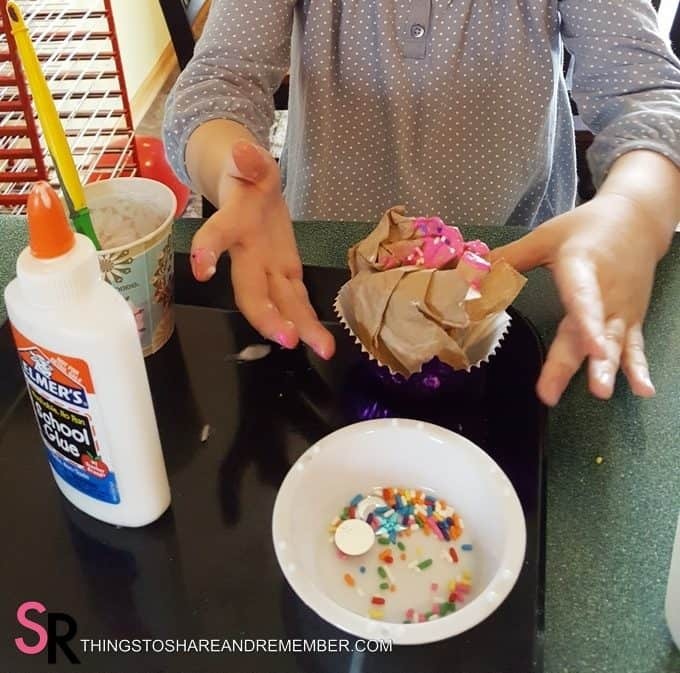 The most anticipated part – adding the sprinkles! We also added a couple acrylic jewels to the top. It took several days for these to dry with all the glue and paint involved. 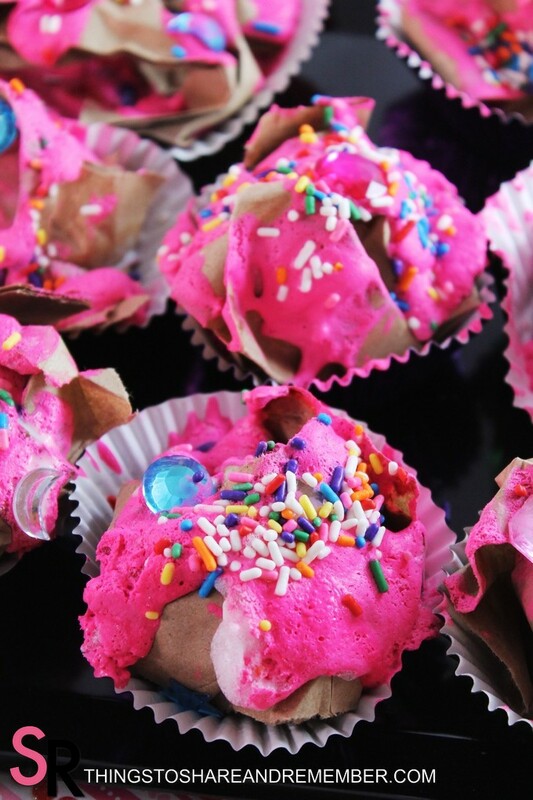 We could open our own bakery! 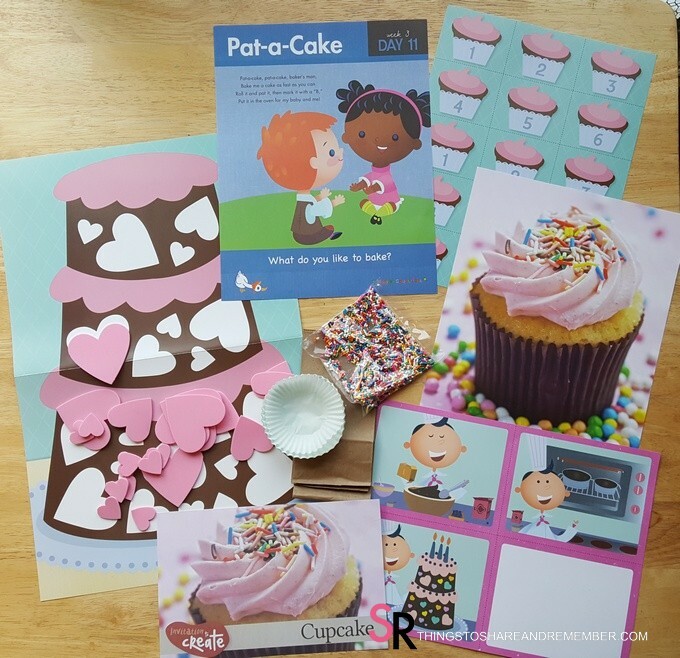 A wonderful Invitation to Create for Pat-a-Cake day! 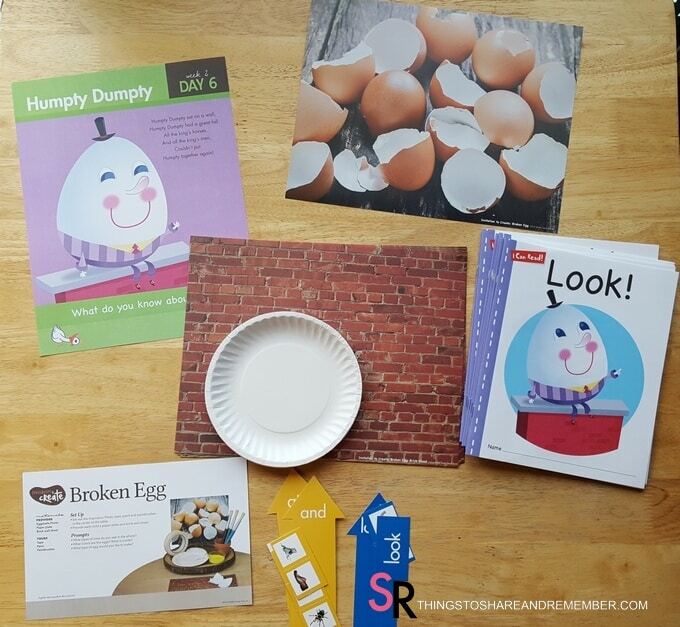 We’ve had so much fun with our Nursery Rhymes theme this month! 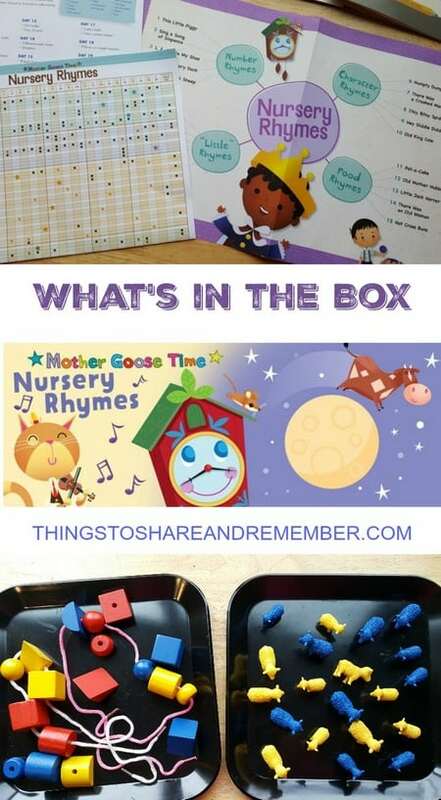 There’s such a range of activities that go along with the rhymes and we’ve enjoyed each one. 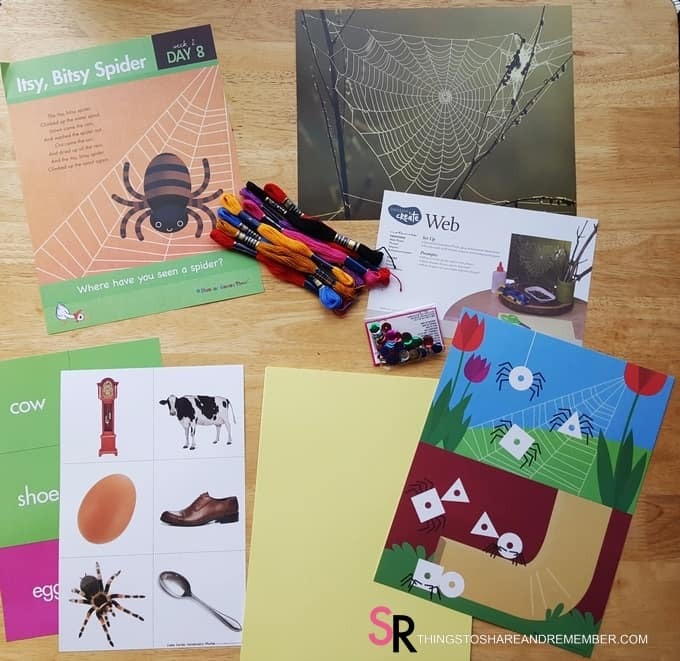 The Itsy Bitsy Spider is one of the more well-known rhymes but that doesn’t mean boring! 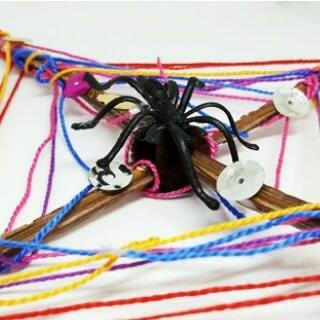 Using the shape design mat and shape beads, the kids matched shapes to the spiders. 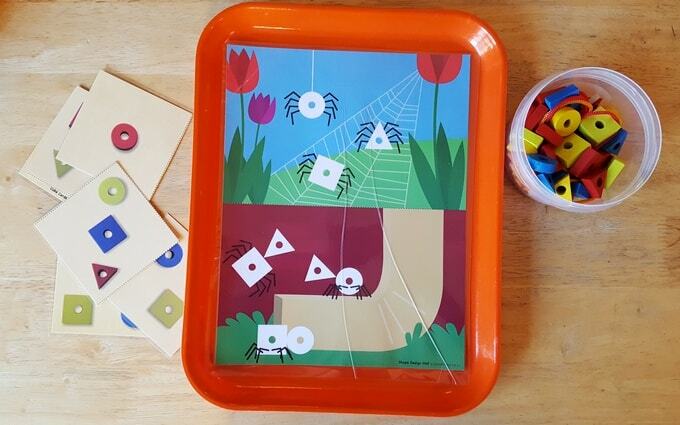 Those are some cute spiders! 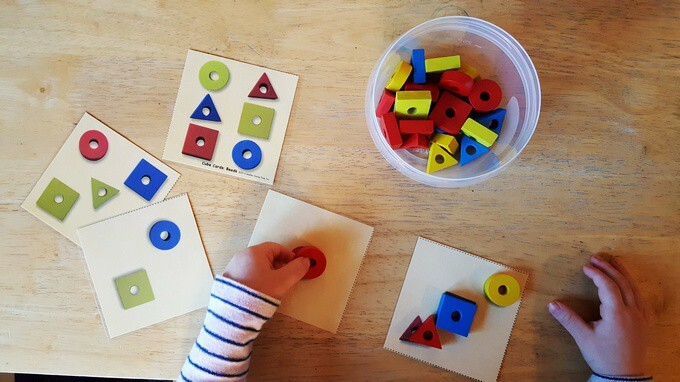 While doing this you can talk to the child about the shapes. 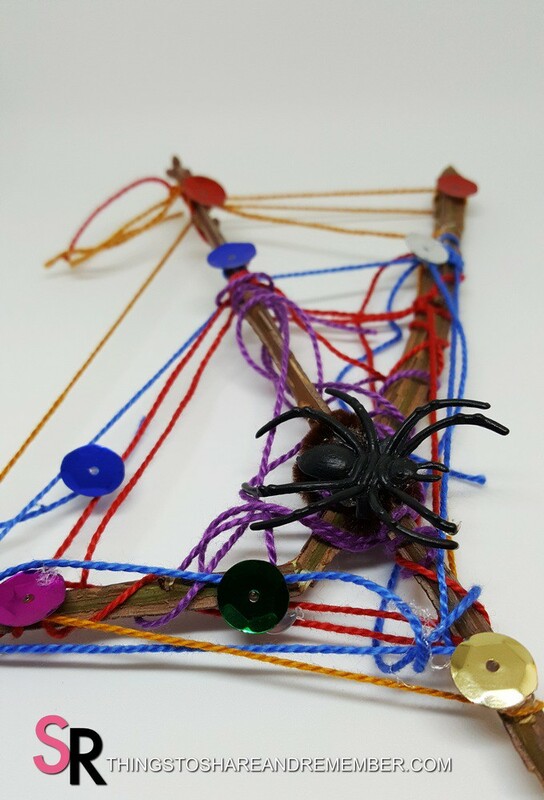 Talk about the colors, count the spiders, ask where this one fits and watch to see if the child flips and turns the beads to make them fit in the shape outlines. 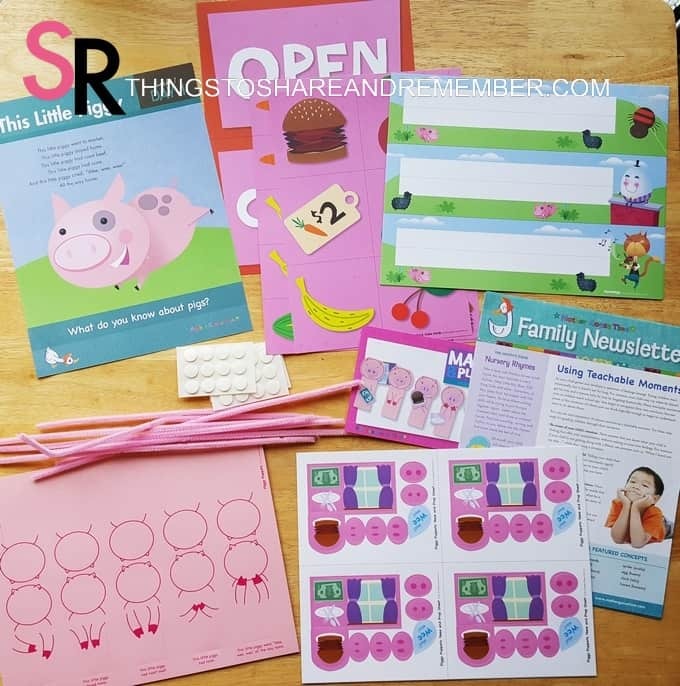 Each month Mother Goose Time includes manipulatives in the kits so we have a lot of materials collected to work with. 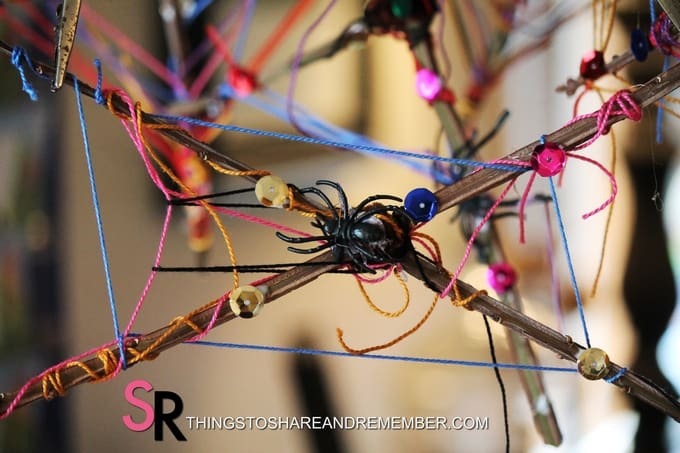 The lacing beads can be used in so many ways! These matching cards are a little more challenging. 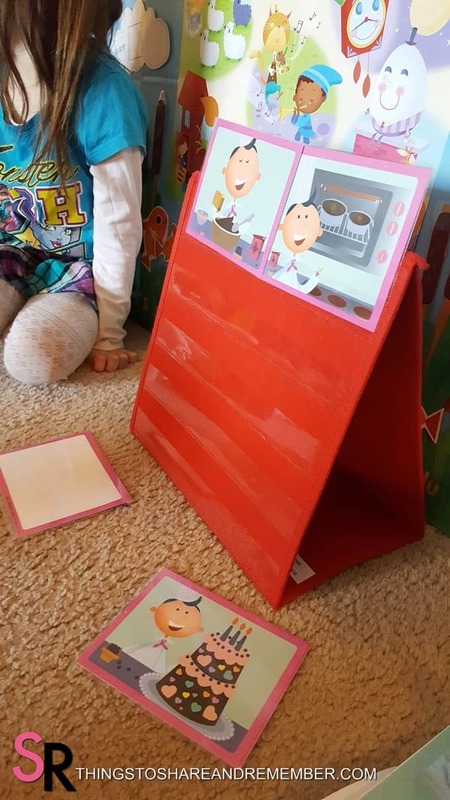 The child can either match the shapes directly to the card or build the design on the table next to the card, using the card as a guide. 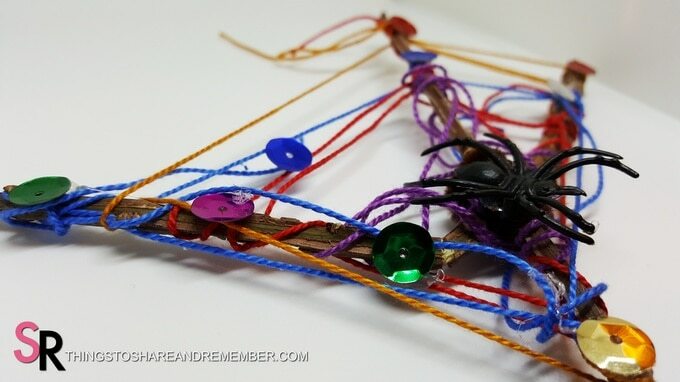 I’m not a fan of spiders and these are NOT ITSY BITSY spiders but they worked for this invitation to create. 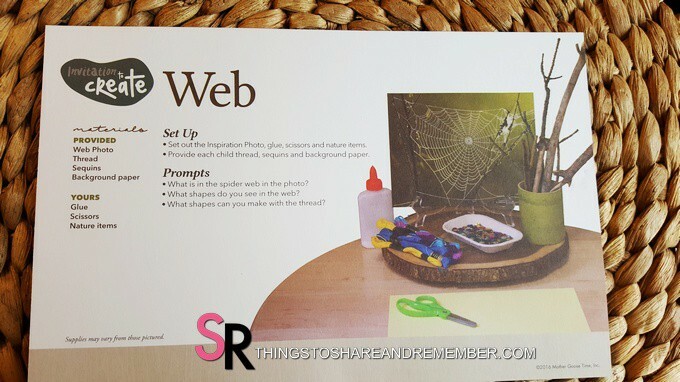 The web inspiration photo is beautiful. It inspired me to take this art project from the flatness of paper to a 3-dimensional craft. It was a bit more challenging but sometimes it’s okay to try something new and see how they handle a challenge. If my younger crew were present, I would have offered the paper version of this project. 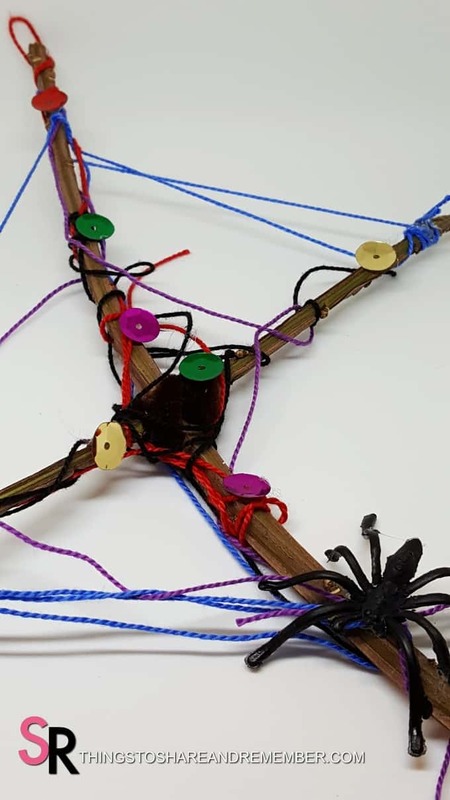 I cut 2 or 3 branches for each child’s project and twisted them together with brown pipe cleaners. 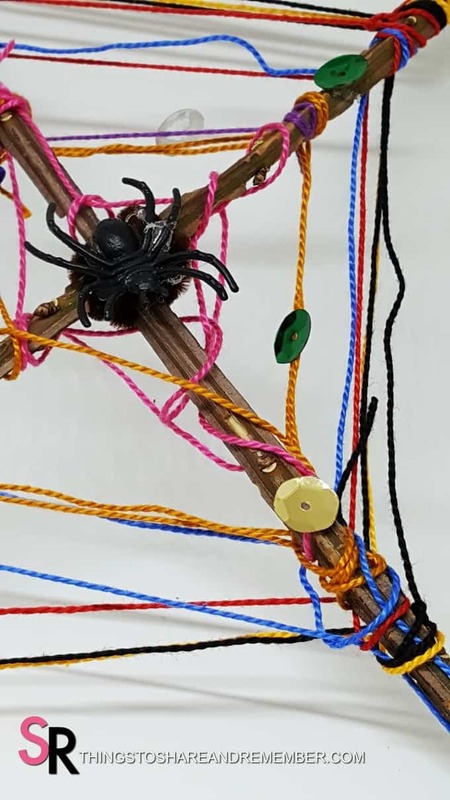 Using the embroidery thread that was included in the kit for this Invitation to Create, I tied a length onto the sticks to get started. 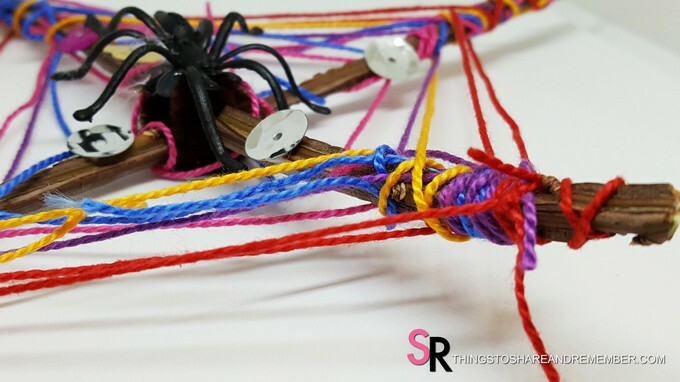 The children wrapped their yarn around the sticks. My group ranges from 3-5 years. Don’t get me wrong, this was challenging but they did so well! They kept me busy asking me to tie on new colors of thread for them to wrap or to knot the ends after they wrapped the thread. When they decided they were done, they glued on sequins for dew drops. 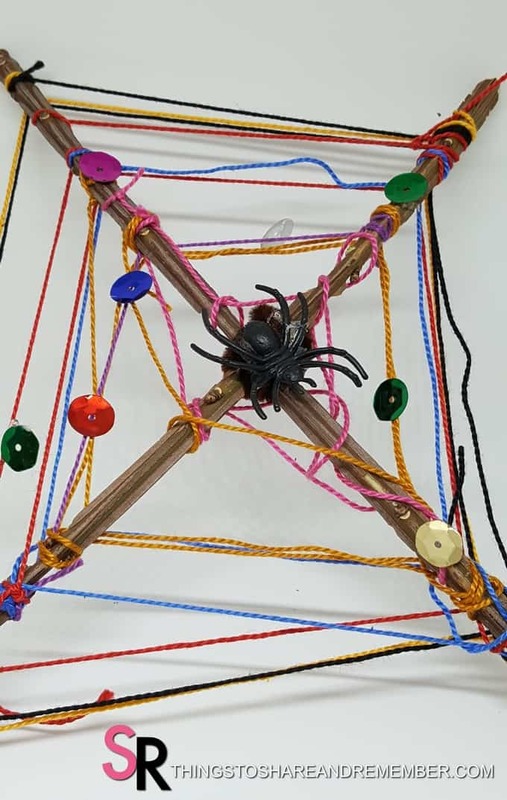 The not-so-itsy-bitsy spiders completed their projects. We had to hot glue those on so they stick for the long haul. 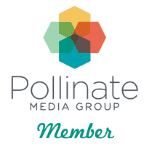 Some are wrapped tighter than others but every web is different, right? 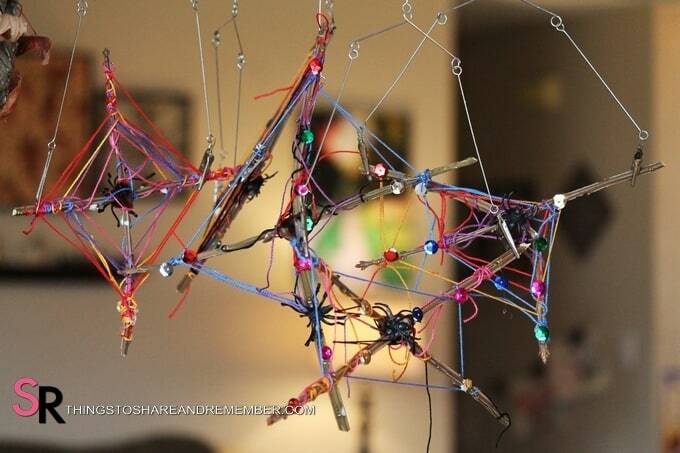 Our webs are displayed on our mobile. It’s hard to see how great they look in the picture. 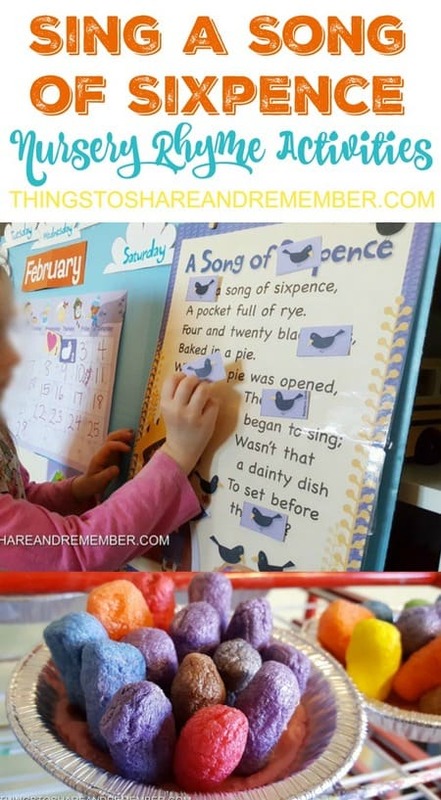 Sing a Song of Sixpence is a strange nursery rhyme (a lot of them are!) with 24 blackbirds in a pie… how can that be? A great conversation with preschoolers! What is a sixpence? What is rye? This version doesn’t go as far as the maid in the garden and the blackbird pecking off her nose, thank goodness! 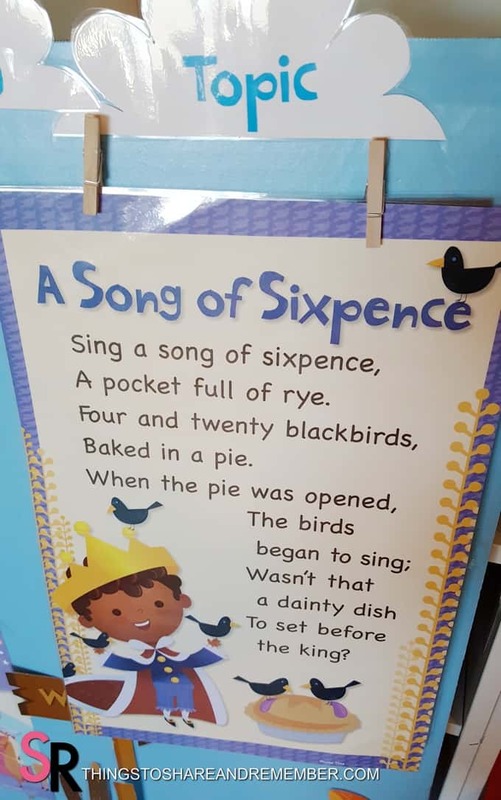 I read a little of the background information on Sing a Song of Sixpence but there’s not a conclusive documentation about it’s meaning. 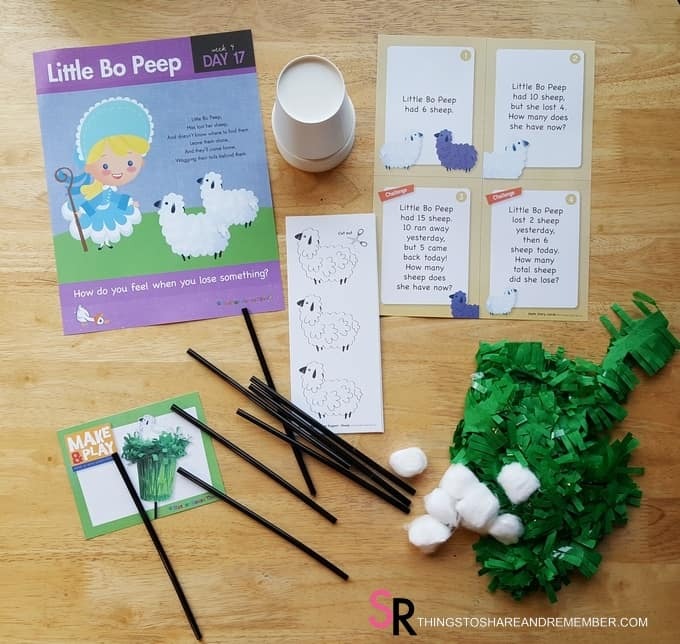 We enjoyed some fun activities surrounding the Sing a Song of Sixpence nursery rhyme, regardless of its origins. 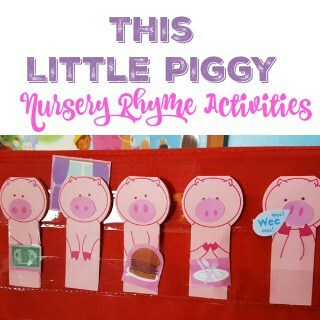 Also, see This Little Piggy preschool activities for more nursery rhyme fun. 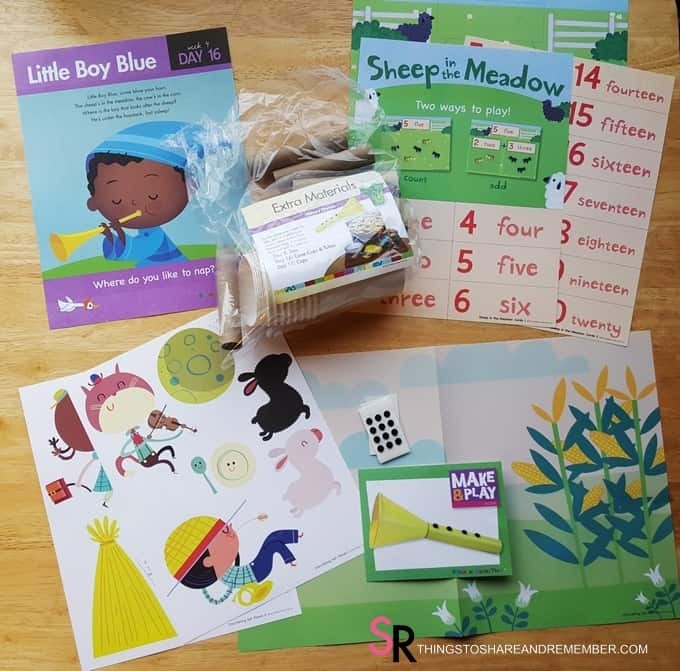 The rhyme posters are one of my favorite materials included in the Mother Time kits each month. 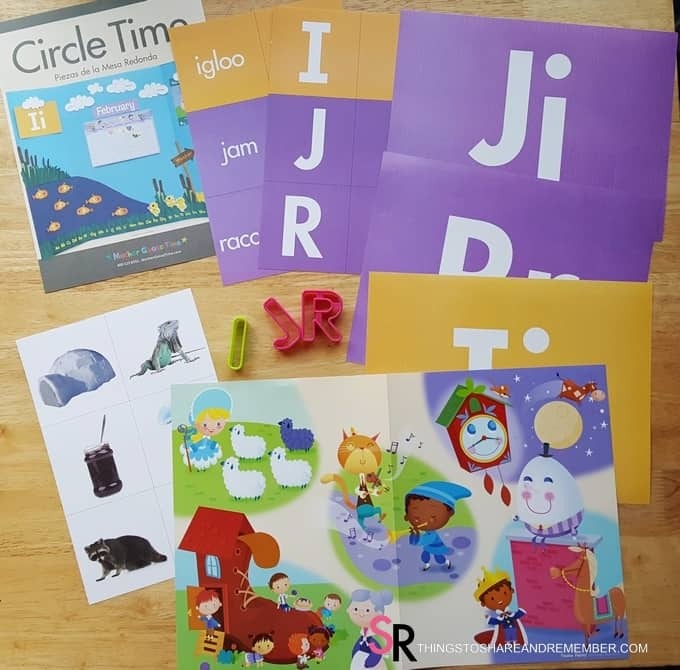 It’s perfect for letter searches, sounding out words, finding rhyming words, looking for punctuation and more. 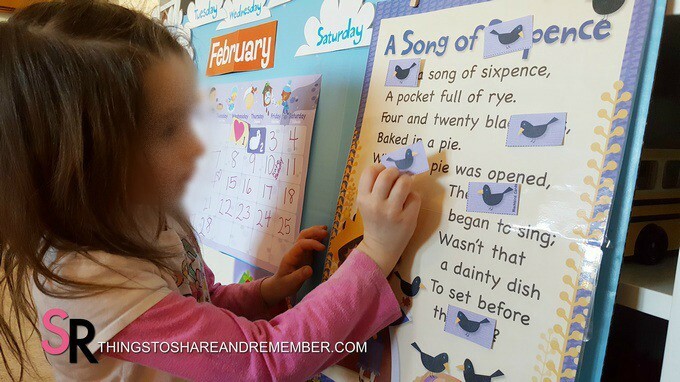 Using little blackbird cards, each child took turns looking for letter I on the paper. 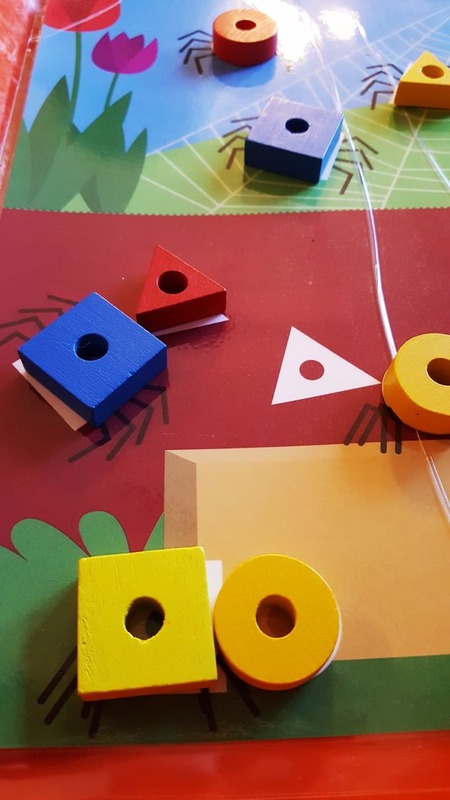 After finding the letter, I said the word and the child covered the letter I with a blackbird card using a piece of tape on the back to adhere it. 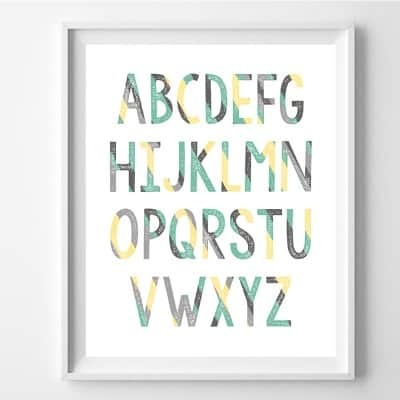 This was a great exercise for letter recognition. In family child care we nearly always have mixed age groups. This is an example of children can learn from one another in a mixed age group. 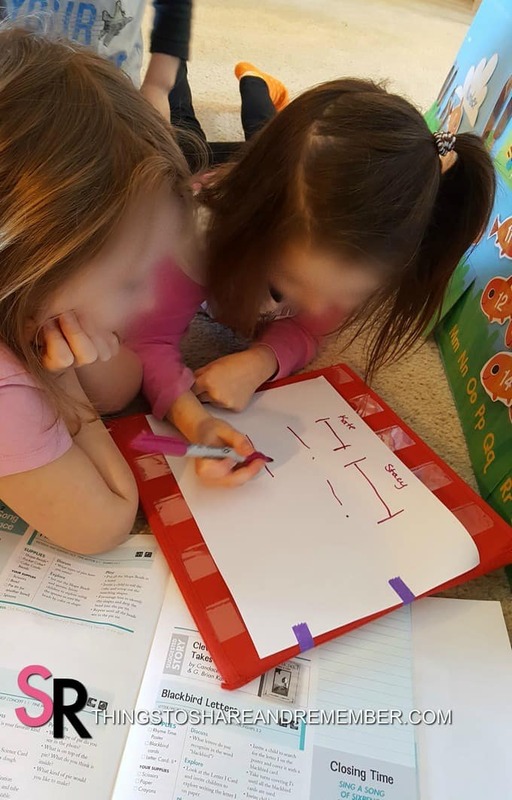 Since my group of 3-5 year olds are learning to write, I’m trying to focus on some writing activities during circle time. 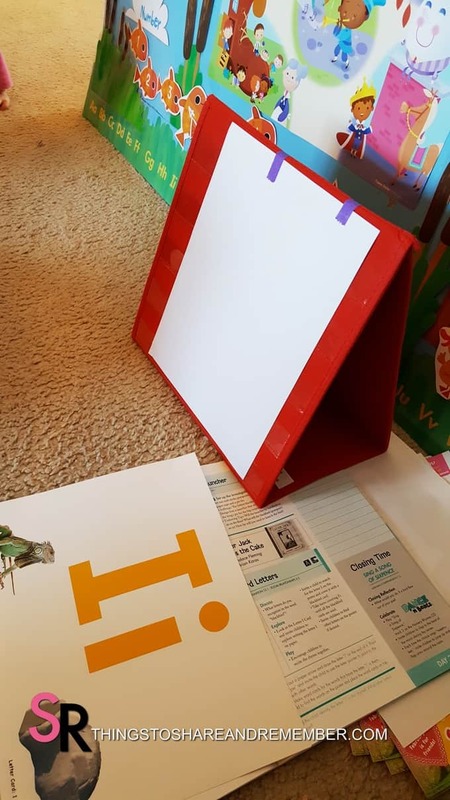 I taped a piece of blank paper to my little pocket chart easel. Then I demonstrated writing letter Ii. It’s easy! Each child took a turn writing letter Ii. A great way to assess writing skills. 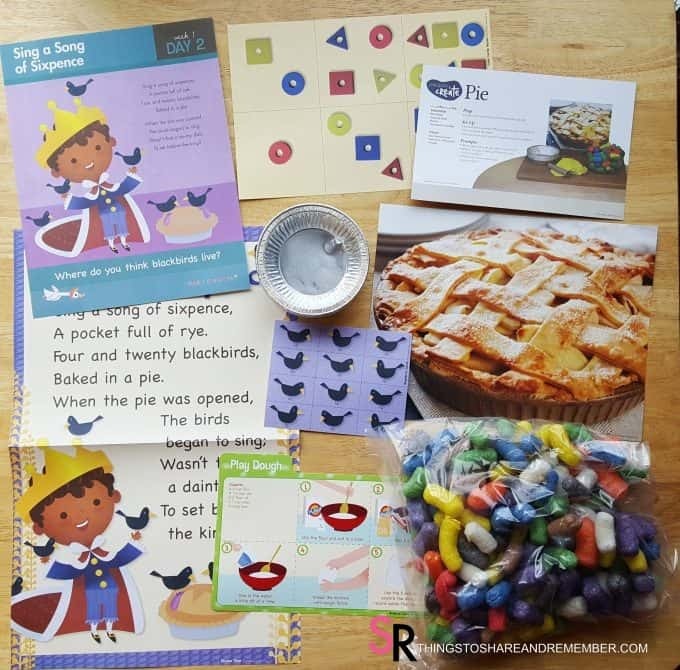 Making pies fit in just perfect with the Sing a Song of Sixpence rhyme! 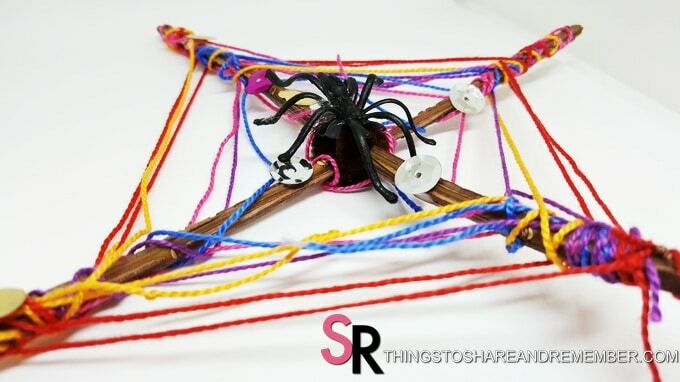 This is such a unique idea. 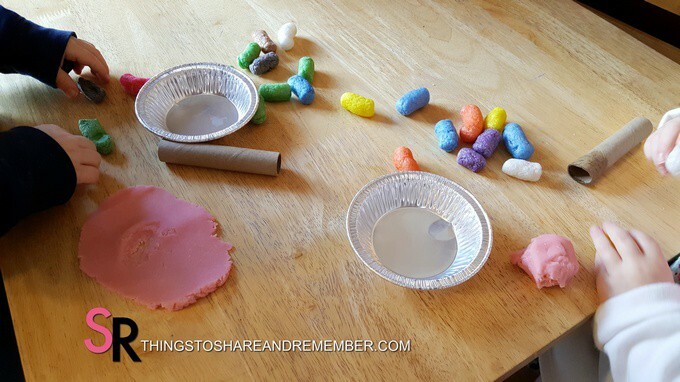 Our supplies included: pie tins, cornstarch noodles, cardboard tubes to use as rolling pins and play dough. 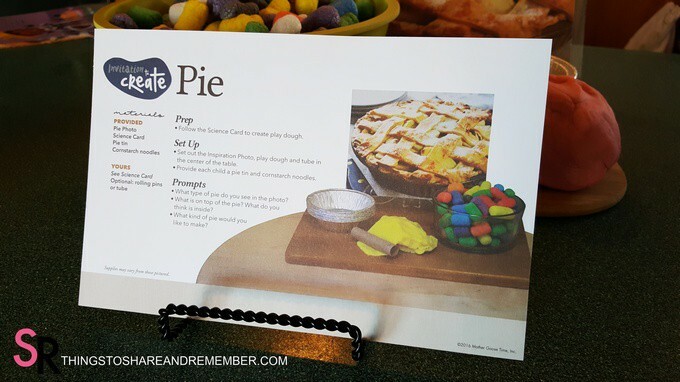 The pie photo is a beautiful image to inspire pie making. 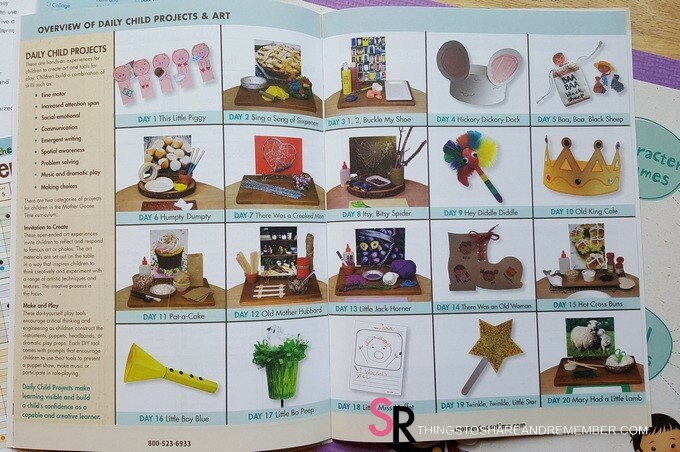 Setting up an attractive display of materials introduces the child to the activity as well as invites their interest. 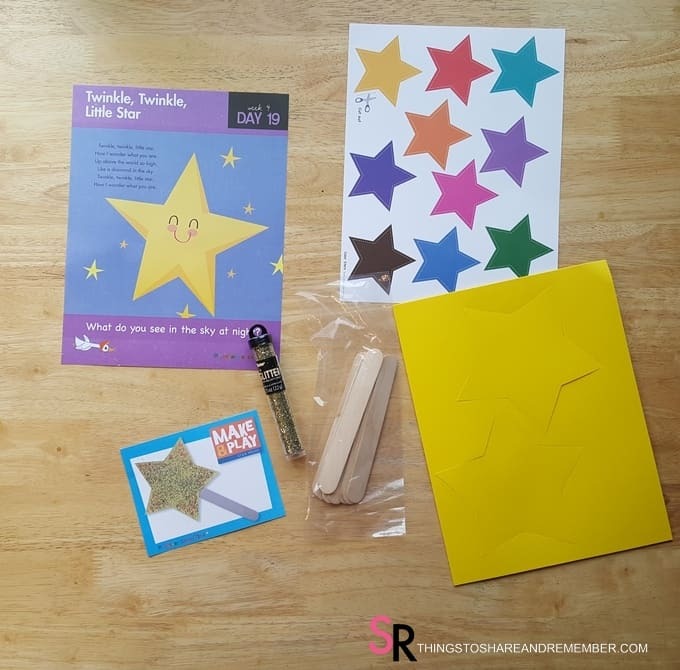 Each Invitation to Create includes a card with a photo and directions. 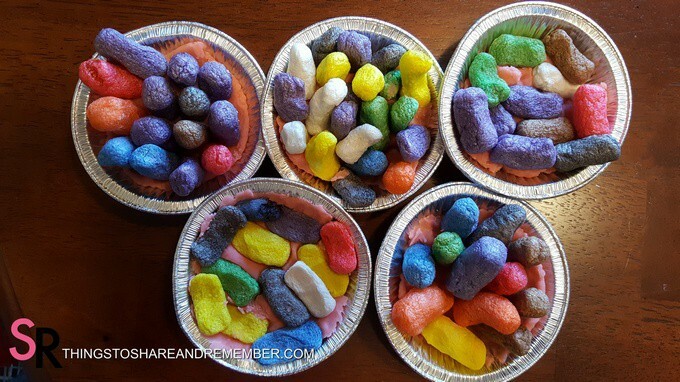 Ask questions: What type of pie do you see in the photo? What can we do with these materials? 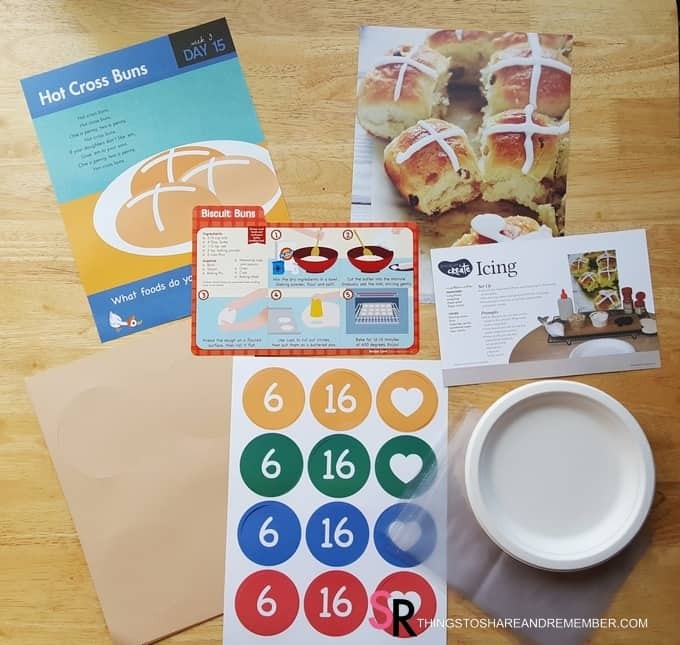 How can we make a pie? Do you see what is on top of the pie -what is it? What do you think is inside? 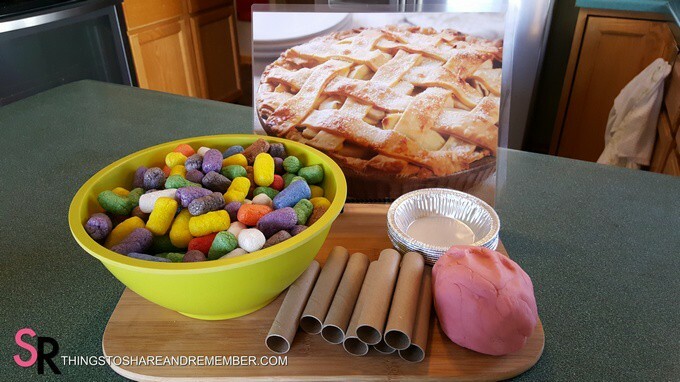 What kind of pie would you like to make? 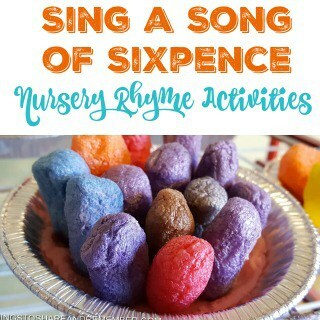 Lovely little Sing a Song of Sixpence pies! 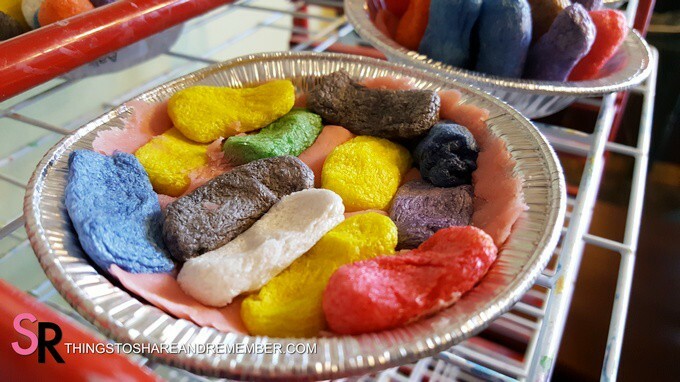 See these cornstarch noodles, all squished? 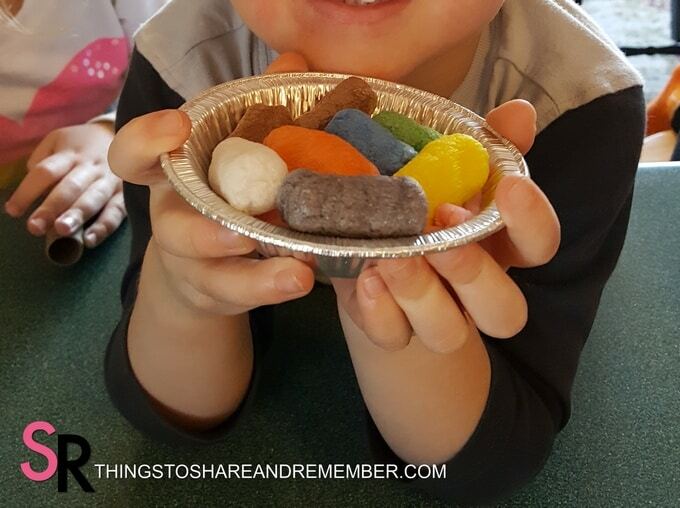 Great exploration and sensory play as well. 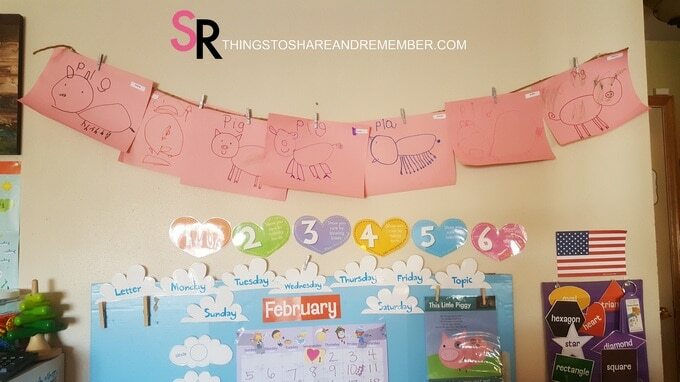 Our February preschool theme started out with This Little Piggy nursery rhyme. 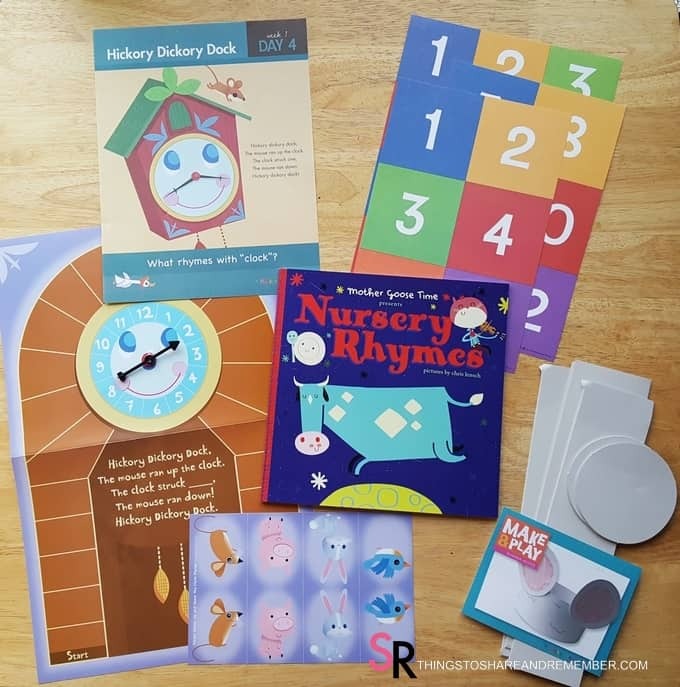 Nursery Rhymes are a wonderful way to build vocabulary and develop literacy skills in early childhood. 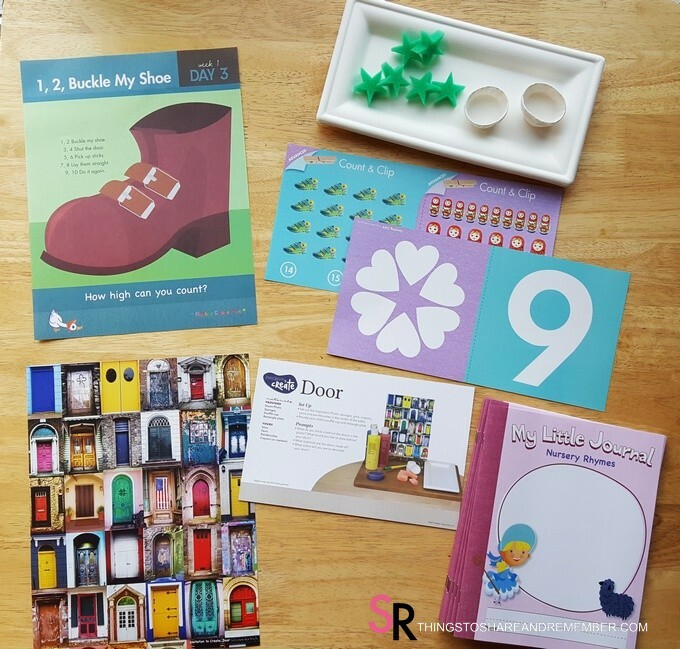 Read 1o reasons why kids need nursery rhymes from The Measured Mom. 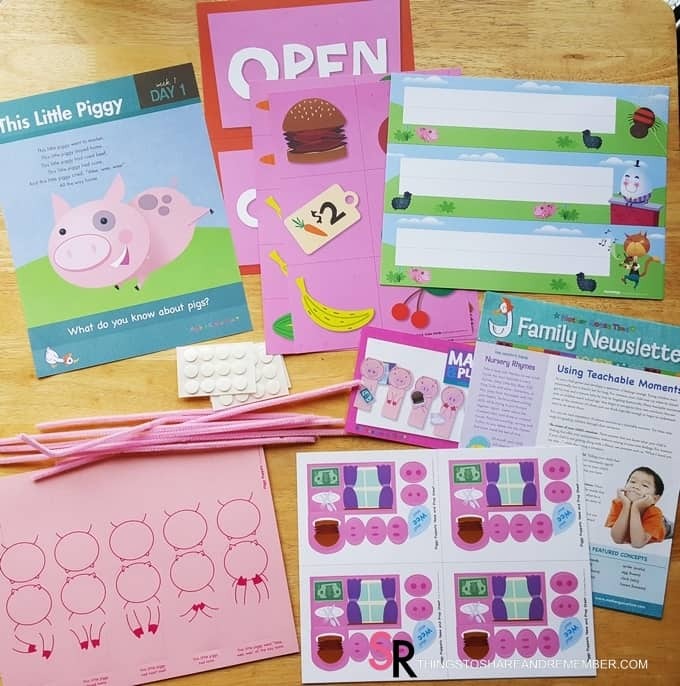 The Mother Goose Time kit for This Little Piggy included the materials in the photo below. 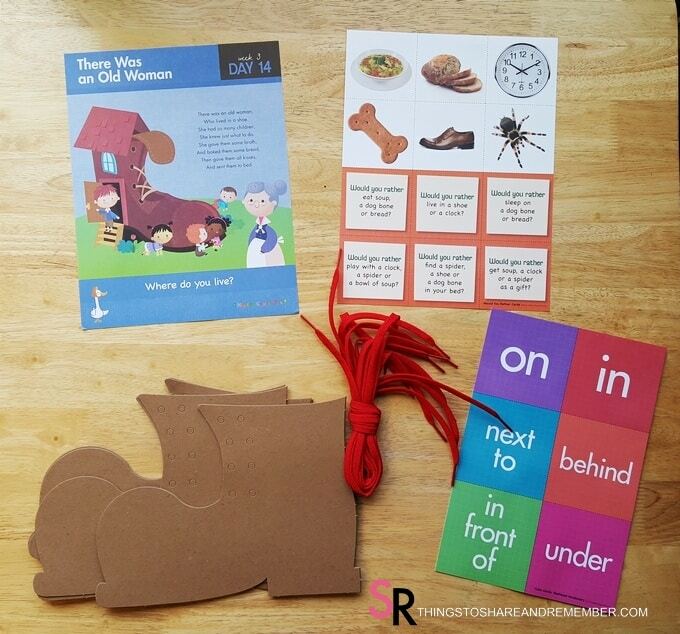 To see what came in the whole month of curriculum, read What’s in the Box: Nursery Rhymes. We used most of the materials included. Some days we just don’t get to everything. 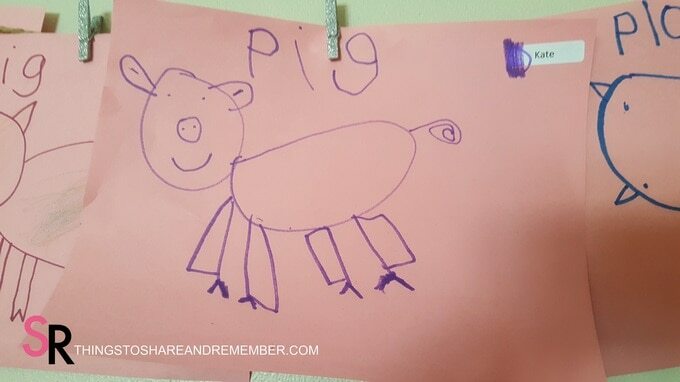 In this case, we didn’t play the Piggy’s Market shopping game. I will save it and pull it out for another day. 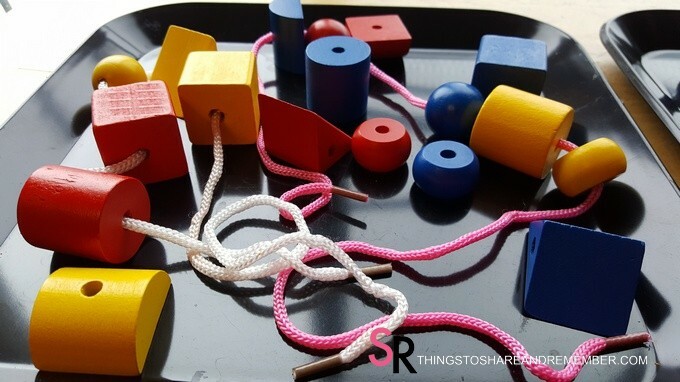 I also didn’t use the pipecleaners for tails on the little piggy finger puppets. It’s too hard to keep them on (I could have used the foam stickers included, hot glued or taped them) but I didn’t take the time. We used them for beading later in the month. 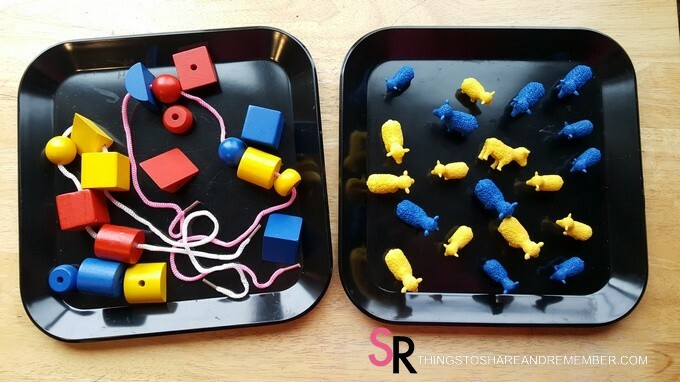 Originally I thought we could curl them to make pig tails for a sensory or STEM activity so that’s another idea. 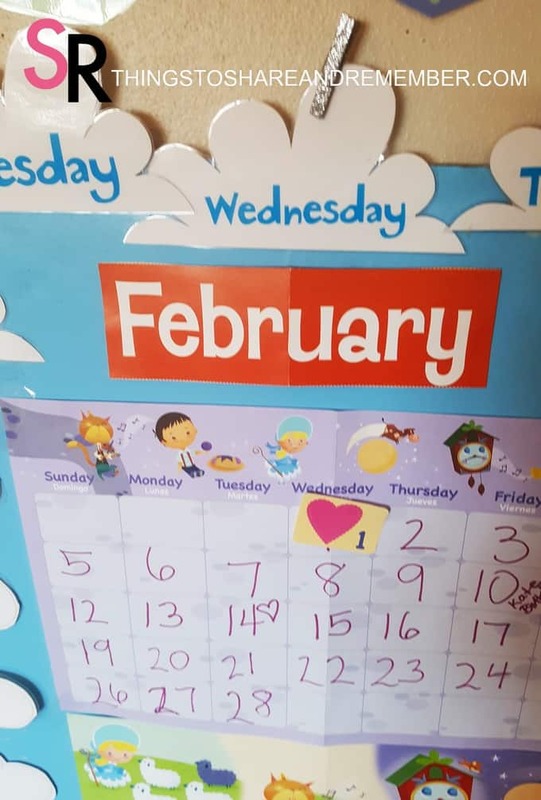 Our February calendar coordinates with the rest of the nursery rhyme as well as Valentine’s Day. 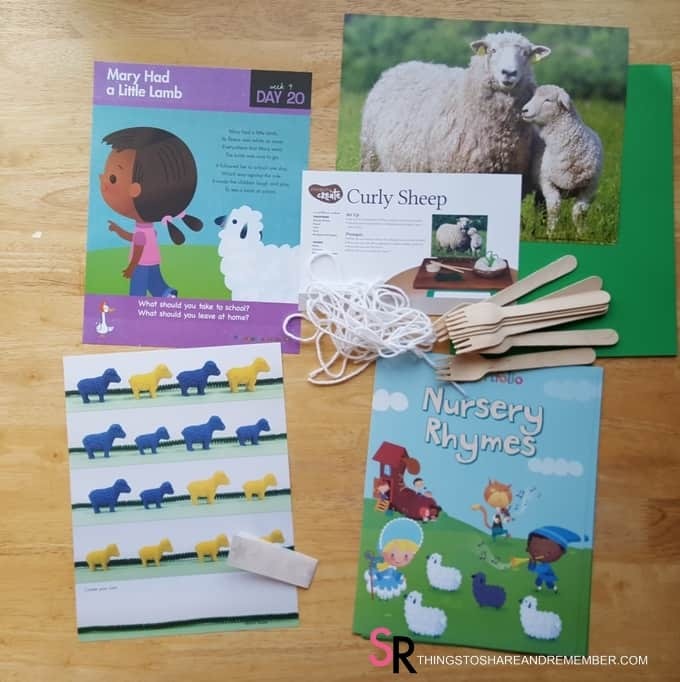 The nursery rhyme daily topic posters are so nicely designed with the words of each rhyme that I decided to laminate them to put in a book form later. The question on the bottom of the poster expands the conversation and learning topic. 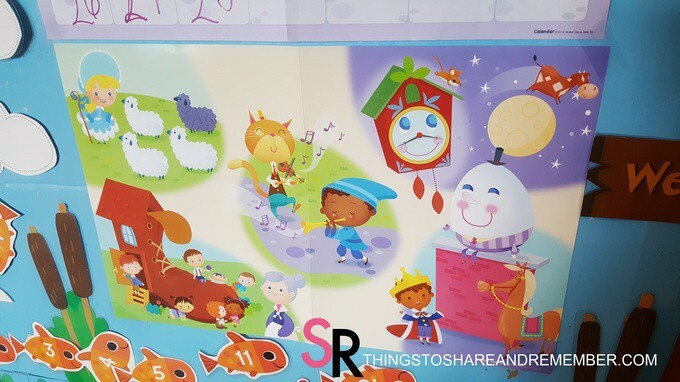 Cute, cute, cute theme poster with many of the rhyme images. One of my 4-year-olds questioned why Little Jack Horner is sitting on Little Old Woman Who Lived in a Shoe’s house. Good question! I explained that the poster is a collage of all the nursery rhymes we’ll be talking about throughout the month. We often came back to this theme poster – the images on the daily topic posters coordinate with the theme poster so they were drawing comparisons and finding similarities between them. 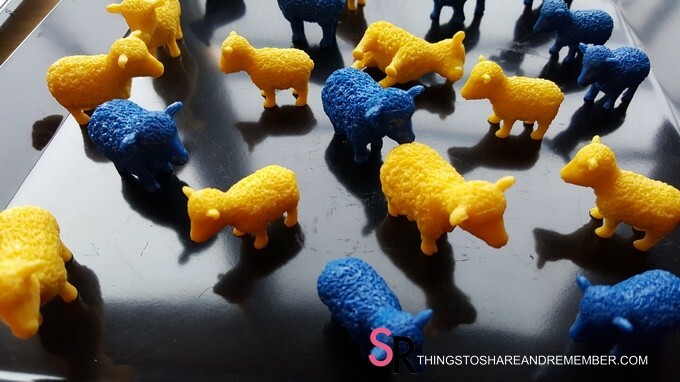 Another question came up – why is one of the sheep black? Another great question! Some sheep are white and some are black. This picture includes Little Bo Peep and Ba Ba Black Sheep. 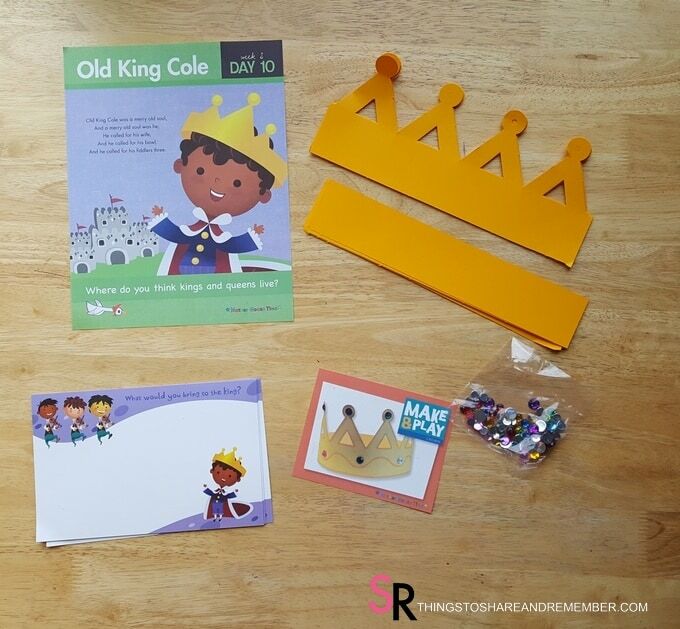 The little finger puppets took a while to put together but the props make the story come alive. 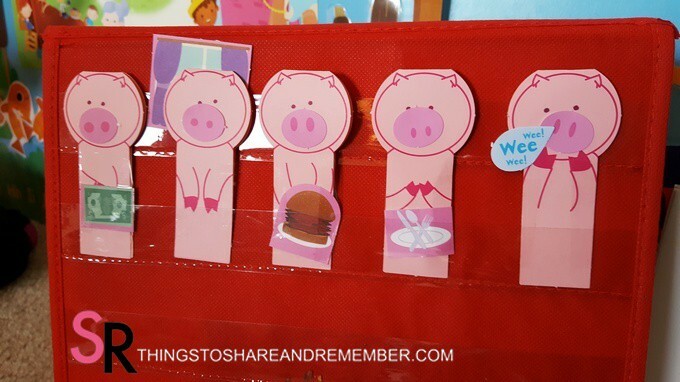 At circle time I used a set in a pocket chart stand (from Target dollar section a few years back, I believe) to hold the puppets. After reading the rhyme we put the puppets in order of the story based on the clues seen on each puppet. I thought it would be fun to draw pigs! 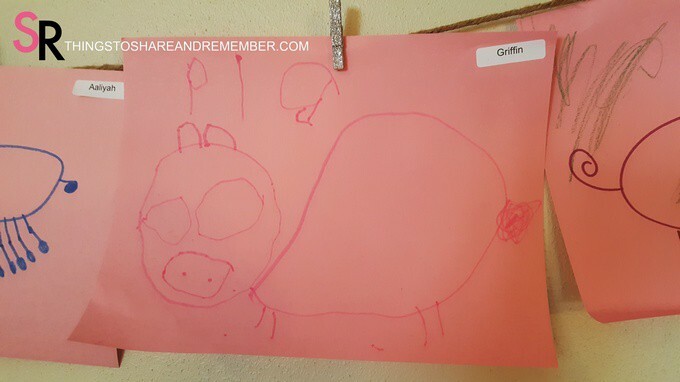 First I drew a pig and showed my group it’s easy to draw a pig with simple shapes. Then they drew theirs! I think they did a fabulous job. 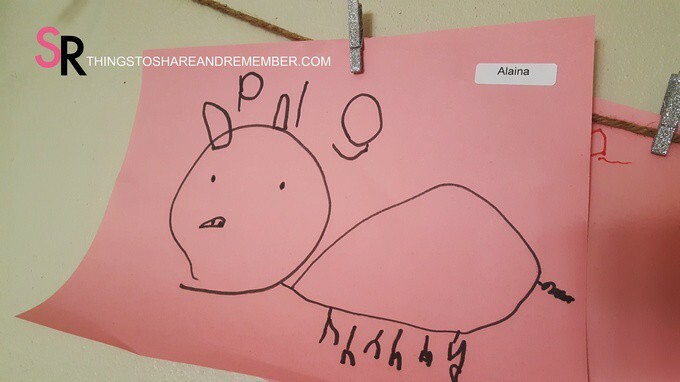 They practiced writing some letters and forming a word: PIG. Each one turned out differently but I can see the attempt and their confidence grow in their ability to draw. 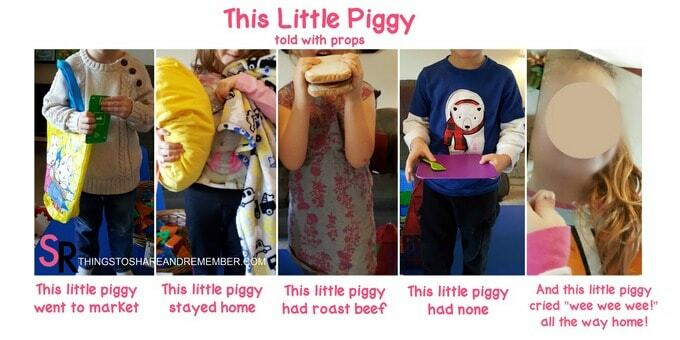 My favorite activity relating to the nursery rhyme This Little Piggy is Piggy Drama. 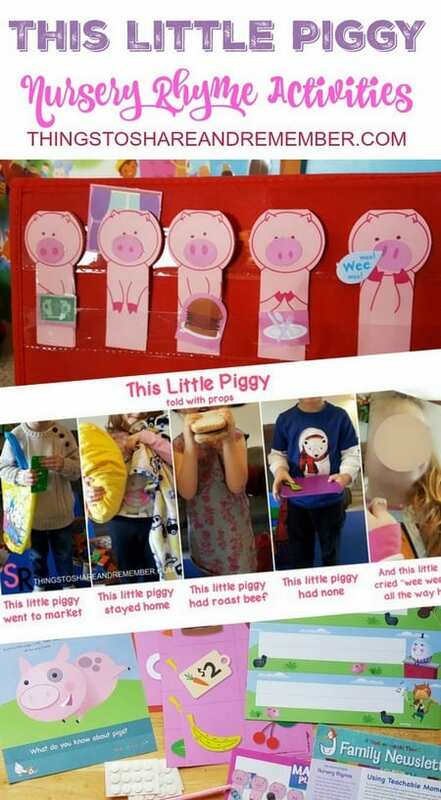 The Investigation Station included different props for acting out the “This Little Piggy” rhyme. Look what happened! Each child chose their props and then put themselves in order. So fun! 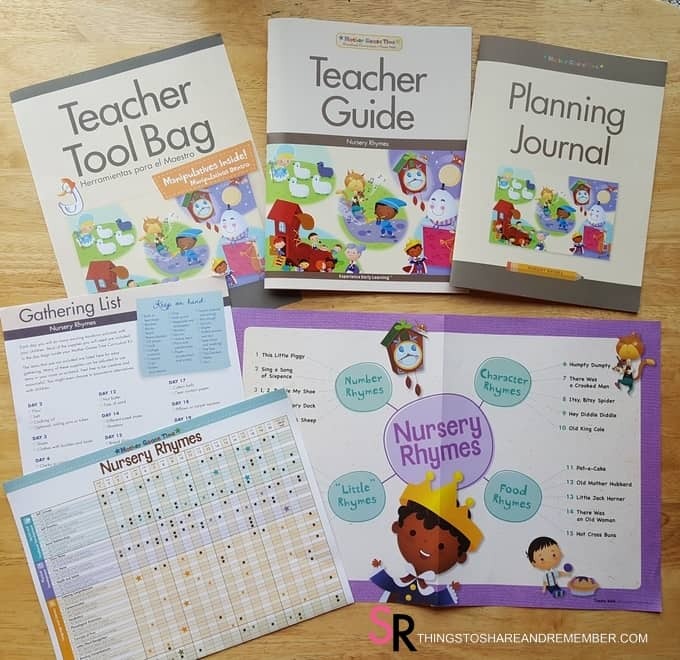 I’ll be back with more amazing nursery rhyme activities! 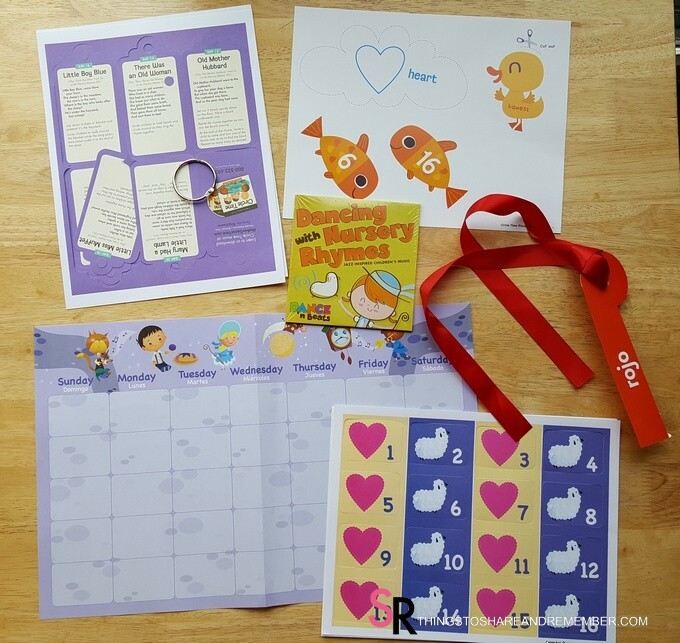 This month’s Mother Goose Time preschool curriculum kit is sure to please once again! The Nursery Rhymes theme is another of my favorites. 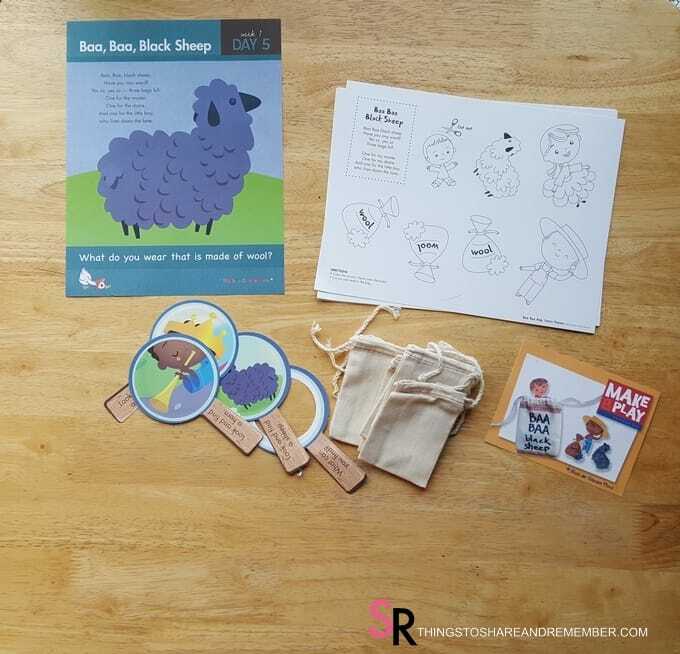 It’s rich in literacy, high on the cuteness level and covers such a wide range of topics. Did I ever mention that I need change, novelty, and variety too? Just like a child. I’m always glad to see my new kit arrive. 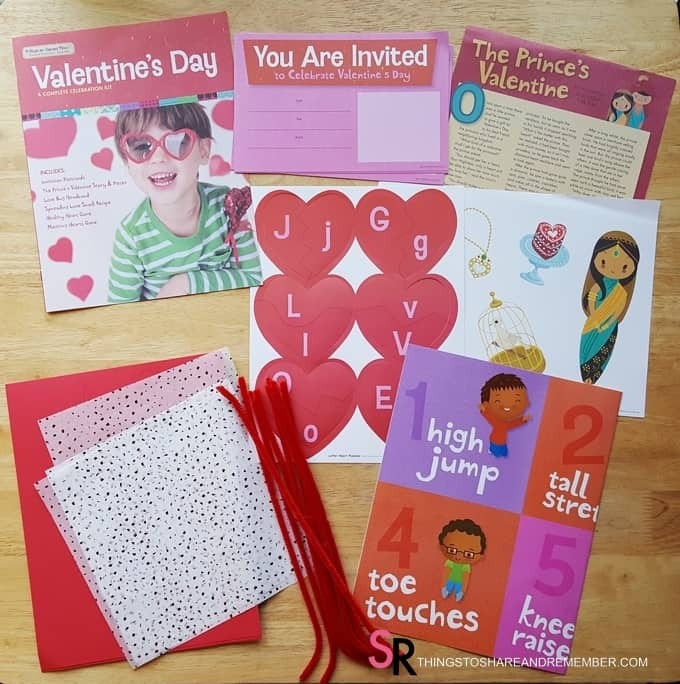 It’s like a fresh start with new inspiration to teach, fresh goals for my group and an excitement to share these wonderful materials in meaningful ways. 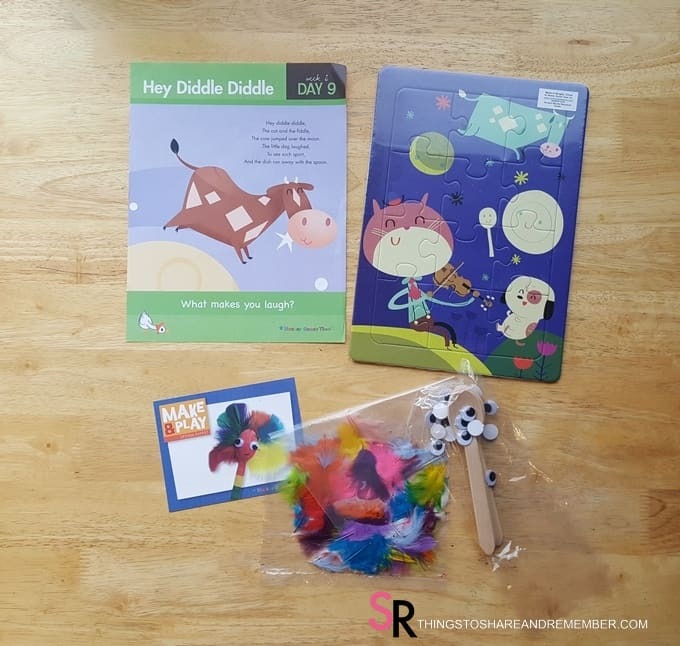 This post covers What’s in the Box: Nursery Rhymes. 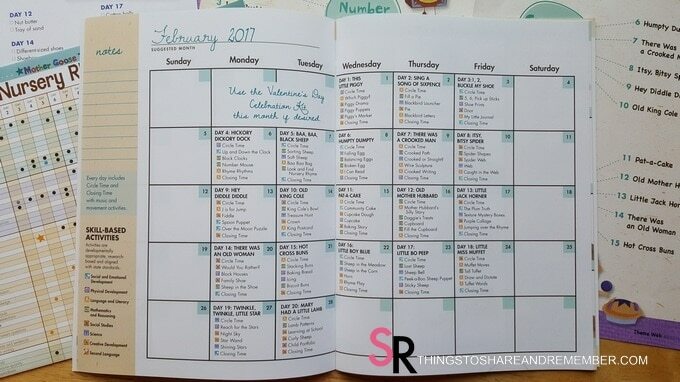 I’ve gone through my whole kit and organized things for the month of February. It’s going to be a busy one for me since I’m starting three (my last three!) Early Childhood Education classes to finish my ECE Associates degree. One of those classes will be practicum, which means I will work in my family child care as usual except I will doing class work along with it. My instructor can also stop in observe my activities and interactions with children. This doesn’t make me too nervous since I’ve been doing this for years and have many people observe me. I feel I almost meet my highest expectation for myself during those times. I will also be entering my 4-week window for my YoungStar formal observation which means anytime within those 4 weeks a rater will come in and observe my work as well so rate my environment, business practices and curriculum. I’m hoping to retain my 4-star status. All this while doing my regular work with a group of 8, completing the other two online classes and trying to maintain family and home life. Here goes! 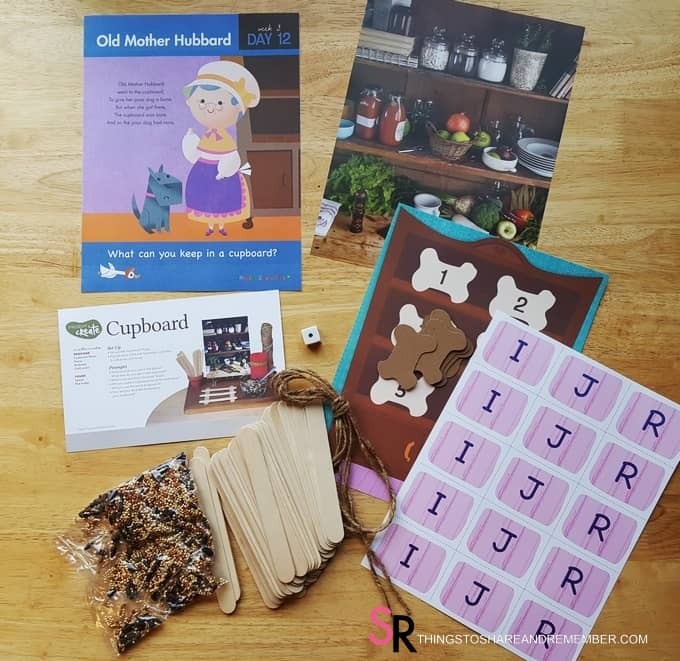 I continue to be impressed with the wide variety of materials, tools, and activities Mother Goose Time provides. This month I laminated all the Daily Topic posters so I can save them and make a nursery rhyme book. 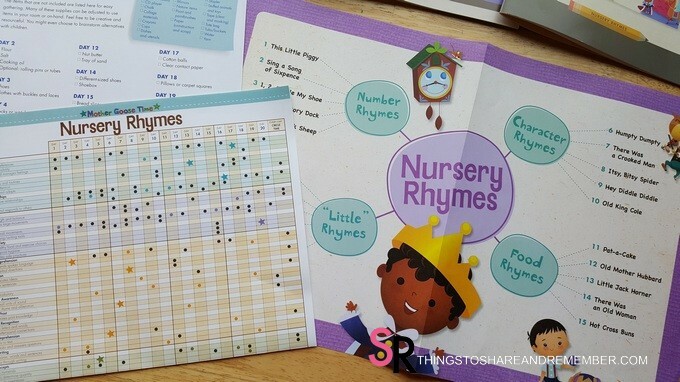 The rhyme pages are so cute, I must keep them! I’m also a BIG FAN of the new photo posters that are included. 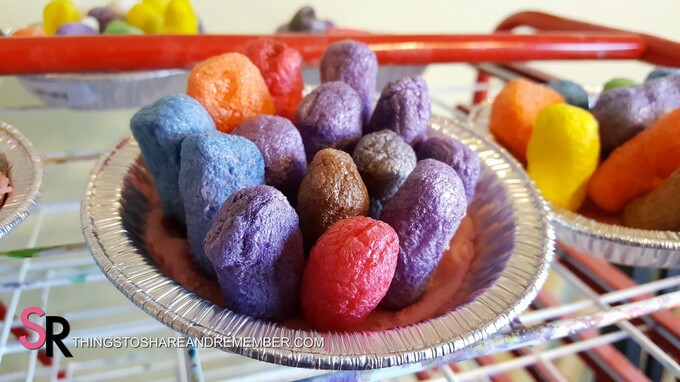 They often provide inspiration for the Invitation to Create art projects but are wonderful for display in the classroom too. They are *beautiful*, quality images. 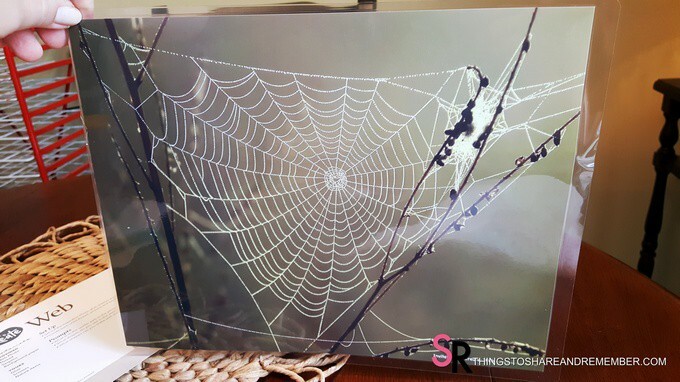 Children need to see beautiful images like this – not just cute clipart. 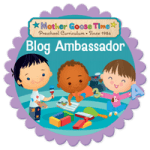 But I love Mother Goose Time for their adorable illustrations each month. I’m not sure how they do it. 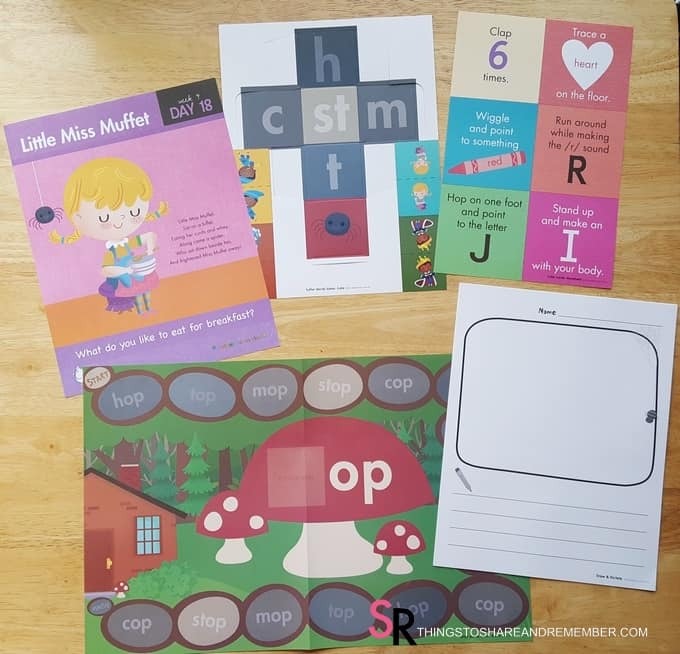 Be sure to look for the nursery rhyme story book, this month’s manipulatives (along with activity cards) and the Hey Diddle Diddle puzzle, which I’m partial to since it’s the name of my child care. 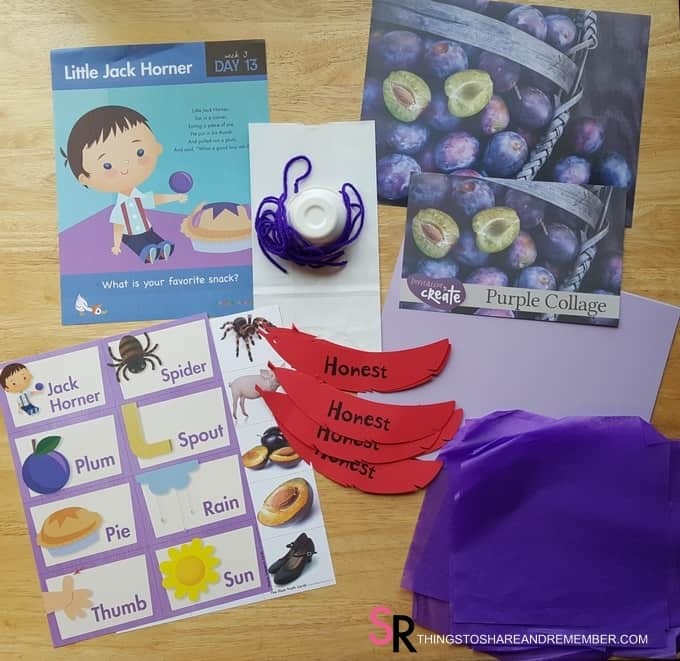 🙂 Day 11 Pat-a-Cake materials are so sweet and I’m looking forward to playing the sight word and number games!